"Now we're changing the number - in Sweden we had a kind of dark number, we want to make it a little bit brighter, and have a little bit more magic", says John Lundvik in an interview to KAN broadcaster. 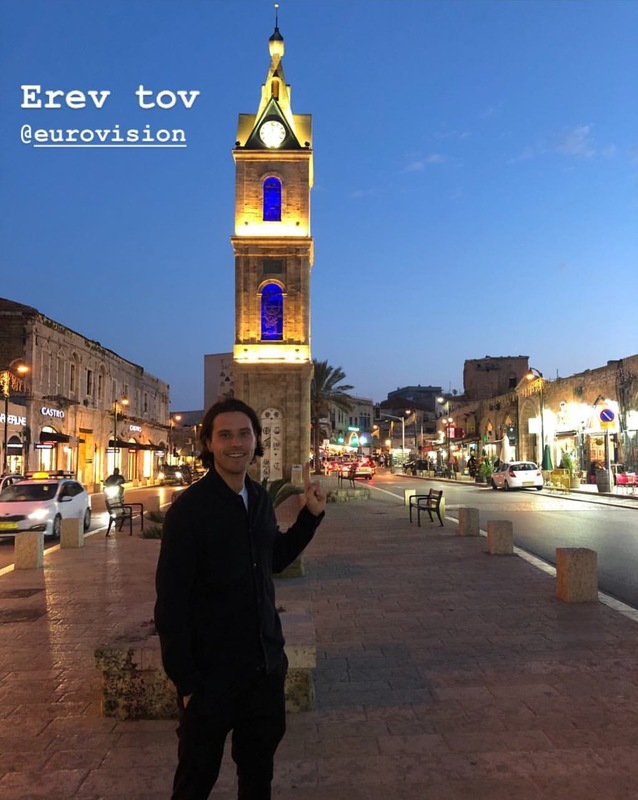 Lundvik is currently in Tel Aviv for the postcard filming. His postcard is being shot in Tel Aviv Port and Swedish artist has to do some roller skating, which makes him a bit nervous. 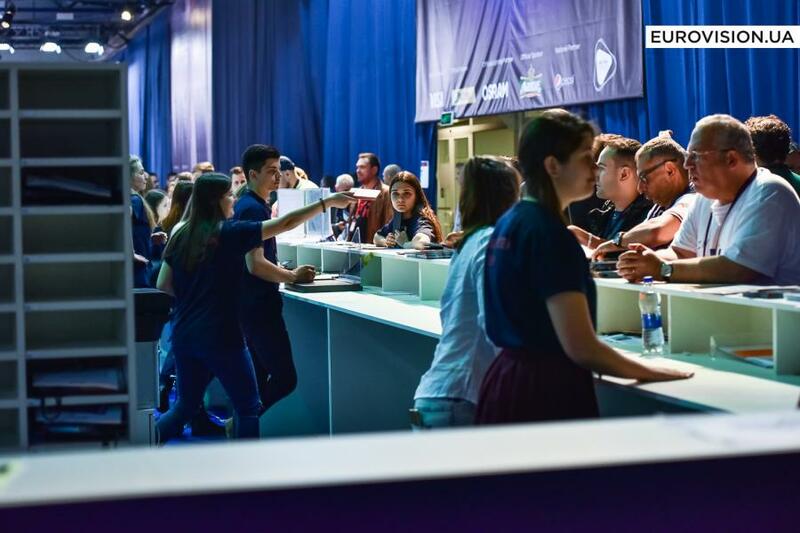 The sale of tickets for the EuroCafe of the Eurovision 2019 in Tel Aviv is underway. It will be located in the club Haoman 17 and will be open from 12 to 18 May. Each evening will start at 23:00. For the first 48 hours tickets are available only for OGAE members who must fill in their membership number in the coupon field. Each member can purchase up to 2 tickets. The cost of a weekly wristband is 420 shekels (105 Euros). Among the EuroCafé guests will be Charlotte Perrelli, Emmelie de Forest, Hera Björk, Selma, Krista Siegfrids, Slavko Kalezic, Shiri Maimon, Harel Skaat, Nadav Guedj, Mei Feingold, Imri Ziv, Moran Mazor, Riki Ben Ari and many others. The Euroclub will also be open this year for OGAE members. Information about purchasing tickets to it will be available on a later date. Acoustic version of "Kruna" and Nevena Božović's team for Israel were presented. RTS this year decided that renowned music names should contribute to their Eurovision entry this year: Ivana Vladovic, Olga Popović, Dusan Alagic and Mladen Lukic can be first heard in the acoustic version and will be part of the Serbian team at the Eurovision Song Contest 2019 . On the Eurovision stage, Olga Popović performed in Azerbaijan in 2012, when she was a member of the band of Zeljko Joksimović, as a vocalist and violinist, and Serbia then took third place. For more than ten years, she is a permanent member of the group Kiki Lesendrić i Piloti , the winners of the last series of music competition, 3K Dur, which performed in the most famous European concerts and collaborated with the biggest names of the music scene in the region. Ivana Vladović performed two times as the backing vocalist - at the Eurovision Song Contest - 2015 she was with Nenad Knezević Knez, and in 2018 with Vanja Radovanović, both have represented Montenegro. This year, together with the Wonder Strings quartet, she competed in the selection for the Serbian representative at the Beovizija Festival. She has been professionally engaged in singing for more than 10 years, she has worked with a large number of musicians from the Balkans, as the lead vocal performed with several famous band bands, and she formed a band under her name. Dušan Alagić is a composer, songwriter, music producer and multi-instrumentalist from Belgrade. As a pianist, the guitarist and the backing vocalist he was part of the Zeljko Joksimović team in 2012 in Baku. Twice he was a music producer for the Junior Eurovision Song Contest, and in 2017 he was a songwriter and producer of the Serbian version of the song "In Too Deep", performed by Tijana Bogićević. 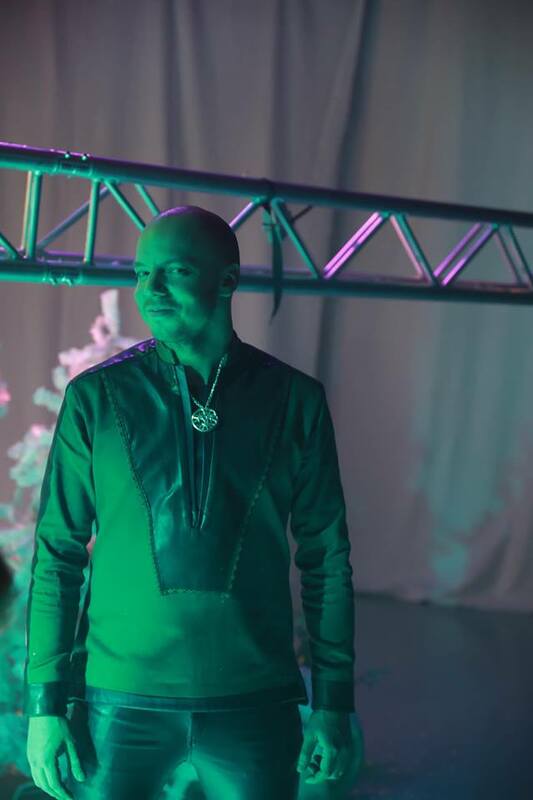 For more than a decade, he has been collaborating with the stars of popular music in the region. Participating in more than 500 songs in the past 15 years and numerous concerts he played, he also became a hitmaker, but also as a studio and concert instrumentalist. Mladen Lukić represented Serbia at the Eurovision Song Contest in Lisbon last year, as the lead vocalist of Sanja Ilić and Balkanika, when Serbia made the finals. He played trombone in the band of Terazije Theatre, followed by collaboration with Zeljko Joksimovic and the Amy Winehouse tribute band. Mladen became known to the public as the finalist of the first season of the TV series "X Factor". He is a professor of instrumental music on the Orchestra section of the Josip Slavenski Music School in Belgrade. Music and lyrics for the acoustic version of the song "Kruna" were written by Nevena Božović. The arrangement was made by Dusan Alagic, who, in addition to the backing vocals, played piano, guitar and bass for the same version, while Teodora Nikolic played violoncello. L8NightStudioBelgrade is responsible for recording and mixing the acoustic version . The Serbian Eurovision Song Contest team continues to work on the promotion of the song "Kruna", and after an acoustic version, the official video will soon be published, followed by a version in English with the symphony orchestra. "Not how I thought this trip would end. With a painful infected foot. Due to a blister. From too much dancing in pinchy heels down cobblestone streets. Doctor says I’m not allowed to walk for a week. The relentless glamour!" Dancers Endi Schrotter and Diego Siqueira will perform on the stage with Roko Blažević for his entry "The Dream". ENDI is 21-year-old Pakracian living in Zagreb address. Also known as 'Croatian Justin Bieber', he is a student of the final year of the Study of Contemporary Dance at the Academy of Dramatic Art in Zagreb, and is the winner of many dance recognitions, among which Oskar znanja in 2016, awarded by the Education and Training Agency for the 1st place won in the State Dance Competition. His megahit 'Atom', which has been viewed over nine million times on Youtube, has launched Endi at the star orbit as a 14-year-old. In parallel with his extravagant career, this teenage idol of the millennium also develops his dancing career. 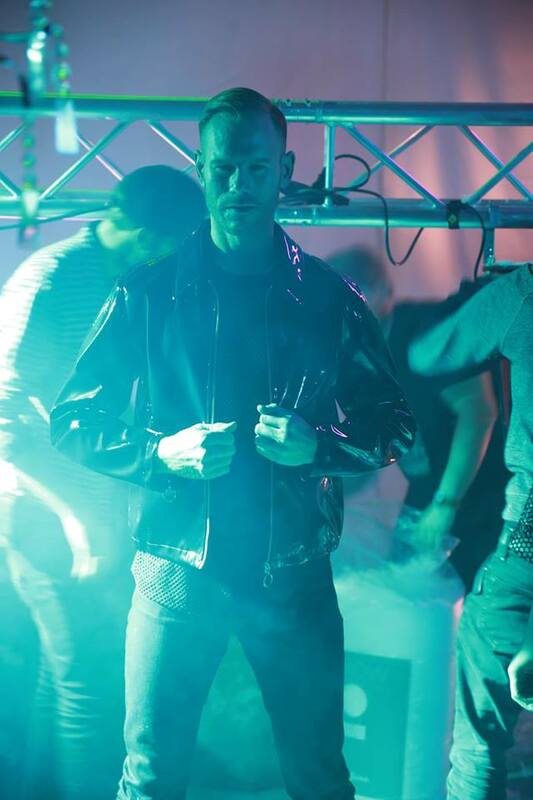 Endi was also member of Jacques team in 2017 and featured in the music video for "My Friend". - To perform at the Eurovision for my homeland for over 200 million viewers for me is a dream come true and a crown is my career! With great joy I accepted the invitation of HRT to help Roko through the dance performance, and for me this is a huge artistic challenge. Dance and music are the rhythm of my life; through them I create, dream, feel, see, hear, enjoy, live life! I look forward to my role on the Eurovision scene and what it will be. In any case, the author team, in collaboration with top choreographer Leo Mujić, has created a great concept that will win the audience all over Europe, I do not doubt it, and I can hardly wait to fly to Tel Aviv and perform on that grand stage and event that provides the highest production standards! Everything you can dream of, you can accomplish! 30-year-old Brazilian Diego Siqueira has a permanent residency in Croatia (for nine years) and has found the greatest passion in hip-hop culture. He has performed and choreographed performances all over the world (Germany, Finland, Wales, England, Italy, Brazil ...), dancing in numerous dance styles (jazz dance, ballet, popping, ballroom, locking, house, breakdance ...) and today he teaches dance at four dance studios in Zagreb and trains over a hundred dancers. He has performed with many extravagant stars, including two Croatian Eurovision representatives - Franka Batelić (at this year's Dora show) and Nina Kraljić (at the Zagreb Festival in 2019). - Since I've learned that I will perform at the Eurovision, with a lot of impatience and excitement, I count the days until I leave for Tel Aviv. Croatia is my new home, here I live for nine years and adore this beautiful country and its people. I thank HRT and the authors of The Dream who gave me this great trust and I was honored to perform as a dancer with Croatian representative Roko. I promise I will do my best to interpret this wonderful music story through the dance movement as best I can. We are a great team, I'm glad that Croatia on Eurovision is sending youth, courage, honest and great talent - I'm sure it can not go unnoticed! - It is a real pleasure to prepare an Eurovision performance with the support of such artists. Endi and Diego are exorbitant dancers, performers of invaluable scenic experience and unseen dance energy. I'm happy that I will not be alone on the stage and that our concept was enriched with the performances of such geniuses. In addition, we are in great agreement, we have the right support and can now say that we are working as a real family, and the team spirit in such projects is the most important. The preparations are in full swing, we are intensely working on the upgrading of our performance and we take every tip of our choreographer Leo Mujić. "I'm proud of the fact that beside Roko, two other young art souls are part of our team. 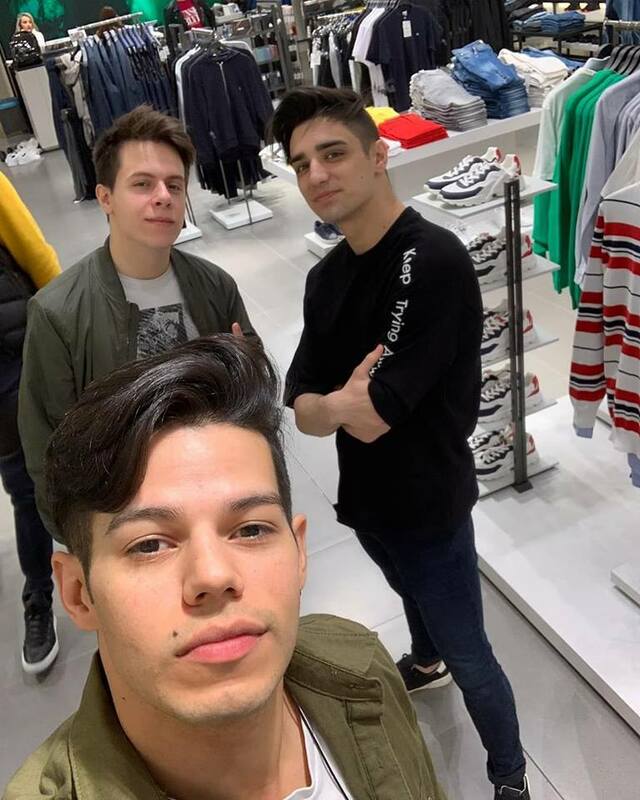 Except that Endi is a large and regionally recognizable teenage star, and Diego is also recognizable in dance circles, both are wonderful and valuable associates and colleagues. I am particularly pleased to see that Croatia will be the youngest force - they deserve it with their longstanding work, and in this way send a positive message and strengthen the vision and mission of our song - dreams come true! An official music video for the song 'The Dream' will be released shortly. To our readers in Tel Aviv: the Tel Aviv-Yafo Municipality tomorrow will be launching sales points of the official Eurovision 2019 branded products, which previously were available to book only online in the Eurovision.tv shop. A variety of women's and men's shirts, jerseys, hats, magnets, scarves, bracelets, lapel pins, branded handbags and even socks will be available. 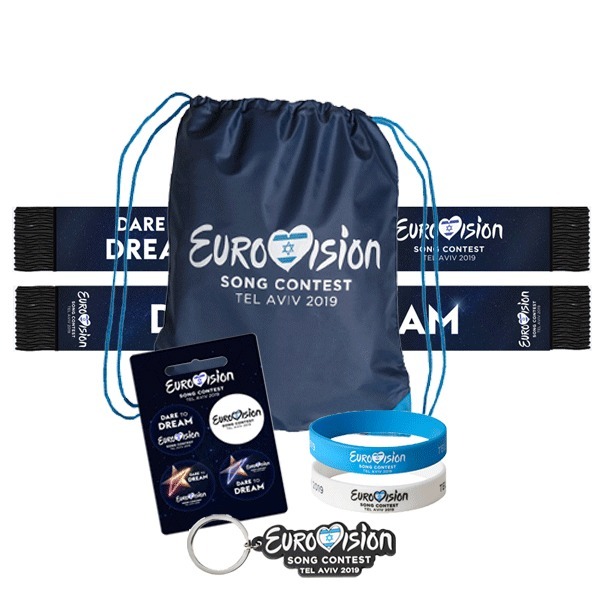 The prices of the products are set by the EBU and range from NIS 20 for a key chain of up to NIS 120 per shirt, which has the official logo of the competition. The products will be offered for purchase from Thursday in the Tourist Information Centers, which are spread throughout the city: on Jaffa's Clock Tower Square, at 46 Herbert Samuel Street and at another sales point expected to open after Passover in Dizengoff Center. During the Eurovision Song Contest week, the products will be sold at additional information centers that will be spread throughout the city, in the official Eurovision store that will open in the Eurovision village in Charles Clore Park and of course at the Tel Aviv Expo. "As part of the municipal preparations for the Eurovision events, the mayor instructed the professional teams to provide both residents and tourists with the best Eurovision experience of all time. The entire city will wear a holiday: in a wide urban branding, in 15 information stations run by hundreds of volunteers - and also with official products that according to past experience are especially popular. We thank the European Broadcasting Union and the Broadcasting Corporation KAN for their partnership and enlistment", stated the Municipality. "I know Israel both professionally and personally very well. So I had thought to emphasize in the design language of triangles and 'play' with them. From triangles the Jewish Star of David is formed. And then I had the idea to symbolize the twelve tribes of the Jewish people. Of course translated into an artistic language, not immediately obvious. Just like last year in Portugal the sea was the topic - waves, navigation. There will be LED walls again. That did not happen in Lisbon , for financial reasons. Besides, the hall in Tel Aviv is not the kind of arena or even a stadium like in Dusseldorf. The hall is smaller, it is rectangular overall. There are many rows of spectators. But you can also see everything on stage from very far back. Of course, there will be standing floor. Without the fans there can be no Eurovision. The director needs them to capture enthusiasm. The Eurovision has to have a flair of party as a staging, this is its trademark. Many technical teams come to the Eurovision again and again, because they know their way around, they have the processes and the need for such a production. But there will also be a lot of people behind the technical scenes, who come from Israel and are part of the creative scene there. For me as a stage designer, I was asked to submit a pitch, an offer. Besides my application, there were twelve others, all from Israel, who submitted their designs"
Wieder also works with the German act by the S!sters. "We will probably refrain from letting them go on stage on a rotating square - that's the way it is. That was a bit confusing, for everyone, for the spectators as well as for the artists themselves. In Tel Aviv, a lot is going on more focused on the message of her song. Their voices, which fit so perfectly together, speak for themselves. For us, it's about putting the ideas that the song transports into the picture"
Wieder will be arriving to Tel Aviv on 18 April, and will stay there until the day after the final with two break when he will have other commitments. He explains his job is not the production of the shows, but their design. RTVE has published interview with artistic director of Spanish performance Fokas Evagelinos and music director Mamen Márquez. 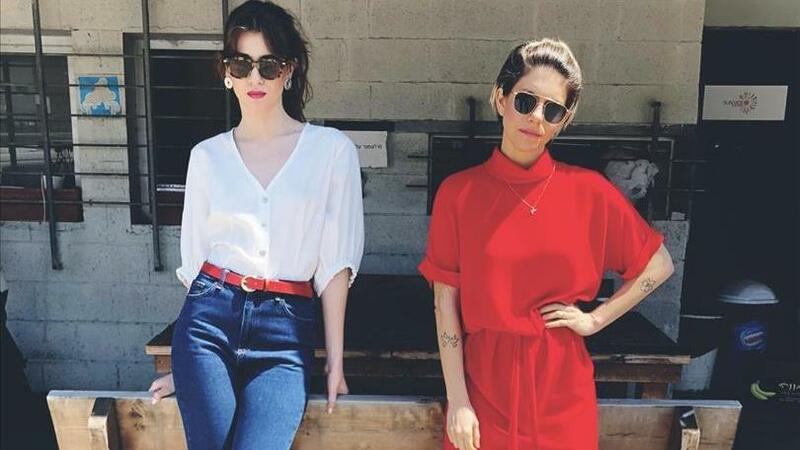 "Fokas and I, we work as a team, although each one of us has a plot, we coordinate so that choreography and vocals do not negatively infer one over the other", says Mamen Márquez. As for working with Miki, both directors agree that he has a lot of energy and transmits it to the team. In addition, the singer is very constant and meticulous, which facilitates the work. Mamen told about some of the exercises that she poses to Miki during the rehearsals so that he can take hold and be able to sing, dance and jump at the same time without running out of air. "We have to fill the whole stage ... and it's a very big space, so we're working on the whole background with exercises like jumping rope or throwing a ball while singing, both he and the dancers," says the expert in vocal technique. For his part, Fokas Evagelinos has given very few details of what it will be like. "I can not say much but I tell you that all the public, both in the stadium and at home, will identify with the staging"
And this is very important, since as Miki has stated on several occasions, there will be no English version of "La venda"; so that the aesthetics, the image and the choreography on the Tel Aviv stage speak a universal language and that the message of the song reaches everyone. This year Fokas also works as the artistic director of Sergey Lazarev, who returns to represent Russia with "Scream". Fokas assures that he works and agreed to work with the Spanish and Russian entrants because they are very different, with completely opposite styles in song, singer's look and staging. Otherwise, he would not have agreed to collaborate with the two singers. In addition, Fokas spoke about Greek own entry of Katerine Duska - he thinks that it is a strong bet and that this year their country can take back the crystal microphone. Mamen, who believes in Miki 100%, also sees Duska with possibilities because, she says, "she has a wonderful voice and it is she who makes the song great"
Tel Aviv municipality has announced several plans aiming to attract attention of tourists during the Eurovision Song Contest. 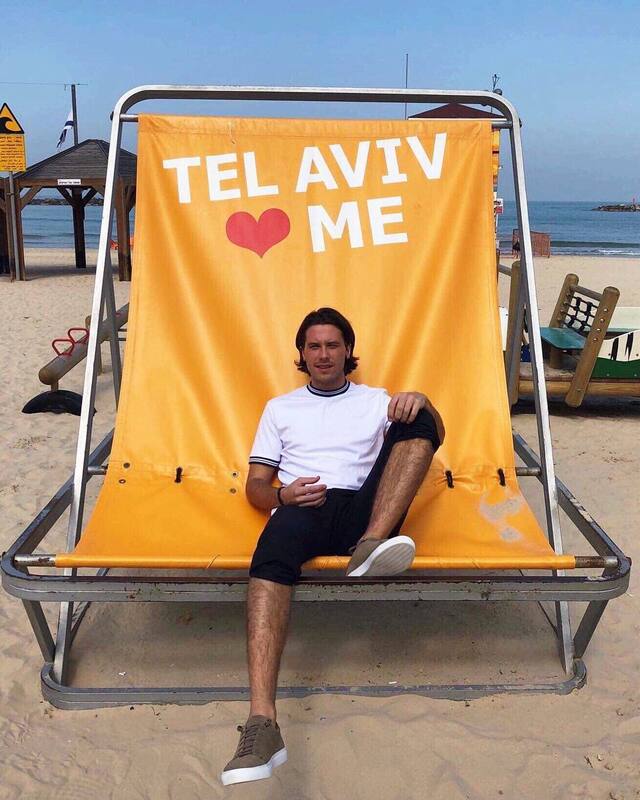 "Tel Aviv does not have a monument where tourists can take pictures, and our thinking is not only how to encourage tourists to come to the city, but how to encourage the friends of tourists to come, and we will do it through social networks, "says Gidi Shmerling, the city spokesman who is responsible for the Eurovision Song Contest in the city. 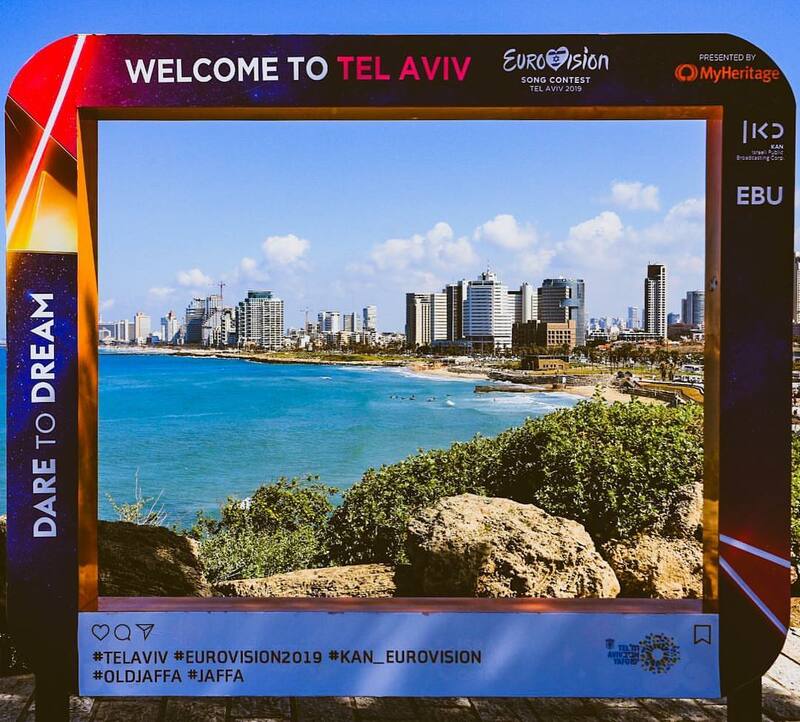 Picture frames: The project has been already launched with several Eurovision themed instagram frames installed in various places of the city. The idea is to direct the tourist to one of the city's most beautiful spots, so that he will later upload the picture to the network with the relevant hashtags. Musical Chairs: At Kedumim Square in Old Jaffa, about 20 chairs will be placed in the form of an orchestra meeting, with the audience invited to fill the place of the musicians. Each chair has a hidden speaker, which is activated by a sensor that identifies someone is sitting on the chair and plays the role of the orchestra player. Thus, everyone who sits down becomes for a few minutes a musician, and when all the chairs are filled, a whole orchestra will be heard, playing different songs. The municipality hopes that tourists will want to take pictures of the events there - and upload the clips to the networks. 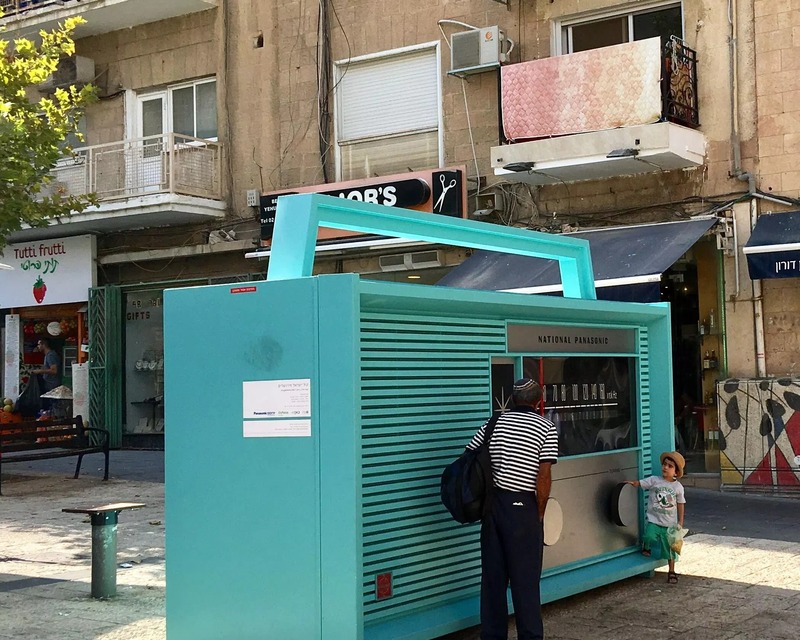 A huge radio: A huge radio, a kind of enlarged transistor, will be installed on the northern side of Jaffa Port. One can rotate the buttons and jump between the stations, increasing and lowering the volume and of course dancing next to it or just listening to music. There will be five stations: Eurovision hits from all years and playlists created by each of previous Israeli winners. 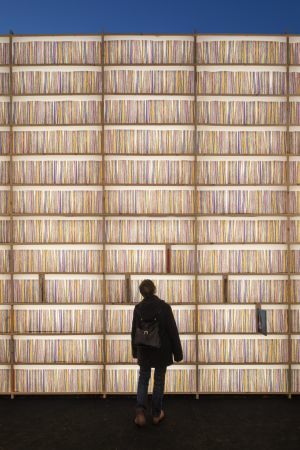 A huge record library: Installation will be placed at the Tel Aviv port. Visitors are invited to walk around the shelves and find records that can be pulled out (as opposed to those that are only the paintings of records). Any record that is pulled from the shelf will start playing from the speakers. In order to hear a song in its entirety, coordination between the visitors will be required. Among the records will be Eurovision hits. 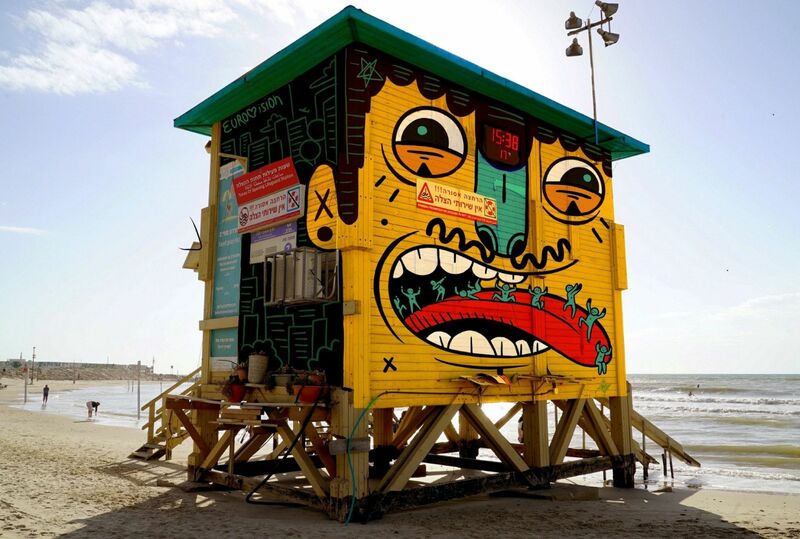 Branding of the Beach Lifeguard booth: The Tel Aviv-Jaffa municipality asked various artists to offer an Eurovision design for the lifeguard's booth on the beach in Tel Aviv. Of the works received, three were subjects of online voting and finally won an illustration by artist Or Barel. Tel Aviv also launched program for businesses "Tel Aviv for 10 NIS". Businesses (coffee shops, bars and restaurants) which will offer some product (glass of beer, wine, or some food) for 10 NIS (2.5 Euro) will receive a sticker stating that the business is participating in the project, and will be published on the city's international tourist site, the municipality website, PR articles and more. "Erev Tov Eyropa" (Good Evening Europe) - studio program hosted by Dafna Lustig and Avia Malka will be broadcast on KAN 11 from this Sunday, April 14 daily from Sundays through Thursdays between 17: 30-18: 00, repeated at 23:20 and 11:30 local time. The program will host the best Israeli Eurovision participants of all time, cultural figures, comedians, singers and representatives of the countries participating in the Eurovision 2019. The program will also include performances by leading singers of the most beloved Eurovision songs. "Good Evening Europe" will also feature special corners, including the digital corner with the participation of Shahar Geva, the corner of "The Kaiser" Itai Herman, in which he examines the knowledge of the hosts and participants on issues related to the Eurovision Song Contest and the "Grill" with reactions to the Eurovision songs. The program's foreign correspondents will review the preparations ahead of the performances, and Shani Nahshony will accompany the broadcast with news updates about what is happening behind the scenes of the Eurovision Song Contest. Confirmed by Live Nation: Madonna will perform at the Eurovision Song Contest in Tel Aviv. On 1 April information was previously unofficially confirmed by Israel Hayom source. Madonna will perform two songs, as announced by Live Nation Israel company owned by Guy Besser and Shai Mor Yosef. The singer is expected to arrive in Israel 4 days before the competition, with a team of more than 60 people and will stay at Dan hotel in Tel Aviv. The person in charge of her appearance in Israel is Assaf Blecher, who has previously produced the Oscars and the Golden Globes. Live Nation adds that it is possible that two other international artists will appear in the show of the Eurovision Song Contest. Canadian billionaire Sylvan Adams, who helped bring the singer to Israel, said: "I believe that her participation in the event will make a real contribution to the success of the Eurovision Song Contest and the branding of Israel in the world". My Heritage Company conducted DNA testing of the winner of Eurovision 2018 Netta Barzilai. Netta's family history is part of the One Big Family project, in which DNA testing of 45 stars from the Eurovision history will be conducted. Netta's roots were found in Poland, Libya and Morocco, by 1.7% she is Baltic, and by 1.5% Irish or Scottish. Details of her DNA testing can be found here, and DNA test of Charlote Perrelli here. The exhibition dedicated to Dana International will move from Holon to the port of Tel Aviv, so that the large audience coming to the Eurovision Song Contest from all over Europe will be able to visit it. The Tel Aviv Port in cooperation with the Municipality of Holon will present "Bereshit, Dana International: The Exhibition" especially for the Eurovision Song Contest which takes place this year in Israel. This partnership between the Tel Aviv Municipality and the Tel Aviv Port with the Holon Municipality will allow the audience who have not yet managed to visit the exhibition at the Beit Meirov Gallery in Holon and the large audience from all over Europe to be exposed to the exhibition devoted to Dana International. The exhibition will open to the general public from Friday, May 3, until Saturday, 18 May, at Pavilion 24, Tel Aviv Port. Entrance to the exhibition is free of charge. Guided tours will be held in Hebrew and English for groups and individuals. Dana International is much more than just a successful pop singer. She's created a revolution in local and global popular culture. Raised in the activist fringes of the LGBT community of the 80's and early 90's, after the Gulf War ended and Tel Aviv returned to celebrate with a growing scene of new nightclubs – a decadent and underground phenomenon that astonished the rest of the country. The exhibit presents fashion items and clothing from her performances in Israel and abroad. The exhibition will also display the draft of the song Diva, the entry requirements for the '98 Eurovision, gold records, certificates and awards, collector's items from the newspaper press, home video clips, interviews and TV clips, photo shoots and fashion productions from her private collection and photos from top Israeli photographers. In addition, the exhibition will display work by new and veteran Israeli artists and designers whose work references Dana's image and her contribution to local and international culture. 10 finalists of the first Eurovision Hackathon were announced. Twenty-four hours of exhausting marathon ended in ten teams reaching the Eurohack Grand Final. More than a hundred developers, designers, product managers, entrepreneurs and fans of Eurovision competed in attempt to bring the knowledge and technology of the start-up nation to Europe's largest and most glittering competition. The challenge faced by teams were to develop accessibility technologies for people with different disabilities, and to challenge the fan experience developing an innovative interactive dimension for the Eurovision Song Contest. Pro Watchers - an application that combines commentaries and responses on Eurovision performances in real time. Unique Real-ity - Creating shared and interactive "viewing rooms" with viewers from all over the world. 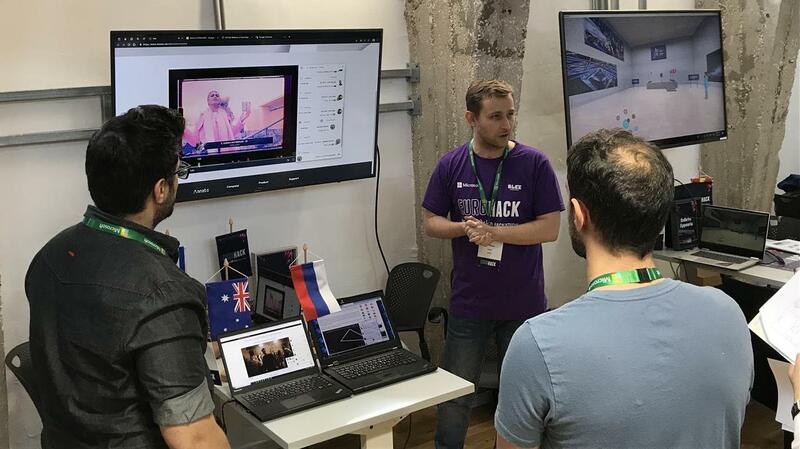 PyroHack - developing an interactive "layer" that presents the Eurovision viewers on screen throughout the live broadcast. Fireworks - an application that allows viewers to share responses and feelings about the competition through emojis. Viewbix - an interactive platform that integrates Eurovision broadcasts with social networks and widgets in real time. Carmel 6000 - Developing a special voting system for viewers with cognitive disabilities. Shmueliz - Improve the immersive viewing experience for viewers with visual impairments using voice commands. ZAZIM - Creating a platform that enables the translation of events on stage by displaying on-screen imagery on behalf of viewers with cognitive disabilities. Eurovision4All - Improving the viewing experience adapted for viewers with cognitive disabilities. The Musketeers - a development that offers a multi-sensory experience for viewers with hearing disabilities. The finalists will have a period of three weeks to polish their projects into a finished product ready to be presented on 29 April to the jury, which will include Senior officials of the digital department of KAN and Jon Ola Sand, supervisor of the Eurovision Song Contest. The winning teams will be invited to follow-up meetings with the European Broadcasting Union and KAN broadcasting corporation to examine the pilot with the solutions developed within the framework of the Hakathon. 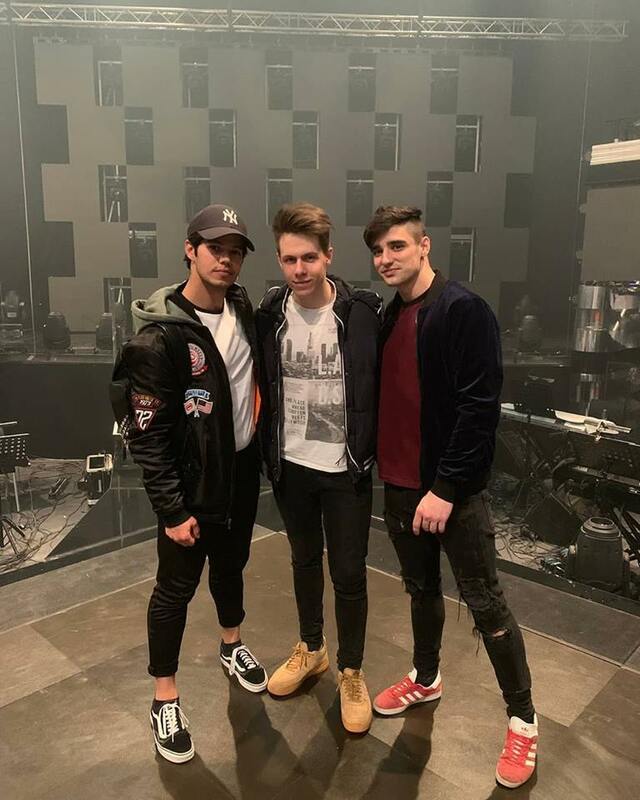 Bilal Hassani had Eurovision party in his home last night enjoying all Eurovision Song Contest 2019 entries: he published videos from it on his Instagram account: @iambilalhassani. Among other things he presented a snippet of updated version of his own entry "Roi". Estonian Eurovision entrant Victor Crone has completed shooting of his postcard. "It's going to be a lot of fun, we were at Tel Aviv Beach. Victor acted diligently and in the meantime even danced a bit, "says Tomi Rahula, the head of the Estonian delegation. 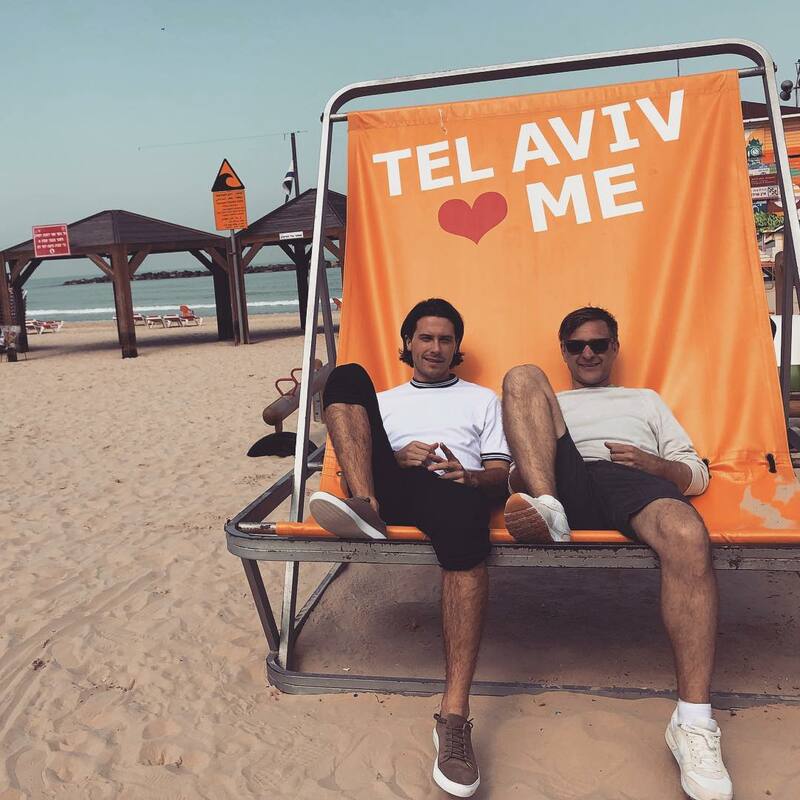 Tomi and Victor traveled to Tel Aviv on Tuesday. "We traveled all day. I arrived earlier, Victor came from Stockholm, and his flight was late, but he still arrived in time. Tuesday was a day of rehearsals, in the evening we went to the old town for the dinner. It is all very well organized here. It's been a great time.". On Thursday Victor had to be in front of the cameras. 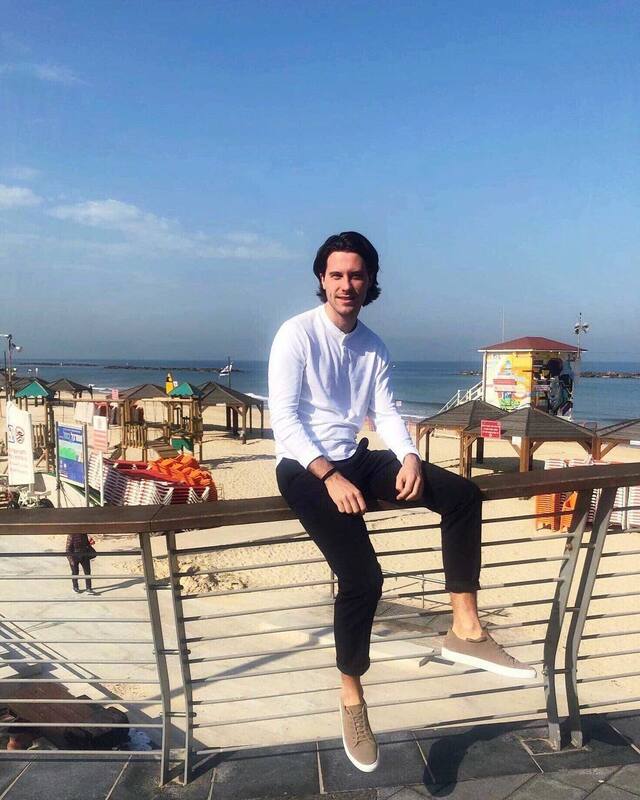 His postcard was filmed at Tel Aviv Beach. "It was great. The weather was super - basically the Estonian summer, 21-22 degrees, "says Tomi. In fact, Victor had to record his postcard already in March, but then the weather went bad. Tomi laughs that he has not yet understood exactly what postcard video is about. "There have been a lot of techniques that were tried out on the rehearsal room with dancers on Tuesday. But all postcards are built on the movement and associated with local dance groups. Singers also move themselves, some do more dancing, some do less". Tomi hopes that result will come out awesome. Tom says that the local team has their vision of postcards and they are not talking about the content directly. "They have their own thoughts and it's not bad. We trust them and everything seems okay". However, each artist posted a list of things he could or did not do, so the film teams were better prepared. Estonian delegation was not able to meet other Eurovision acts who were also in Israel for postcards shooting. "They have several filming crews, and shooting take place in different places at once. Teams come and go every day, but we haven't had time to meet them. In this sense, we were lucky to get our shot in Tel Aviv and didn't have to drive two hours in the morning to get to the scene." Next weekend, Victor Crone will attend the Eurovision promo-event in London, and after that he will fly to Madrid. "There are no other plans except for Estonian performances. If we get the final confirmation of the stage, we need to take some more rehearsals, "says Tomi. Upon return home, yesterday Crone already made appearance at 30+ party in KultuuriKatel. 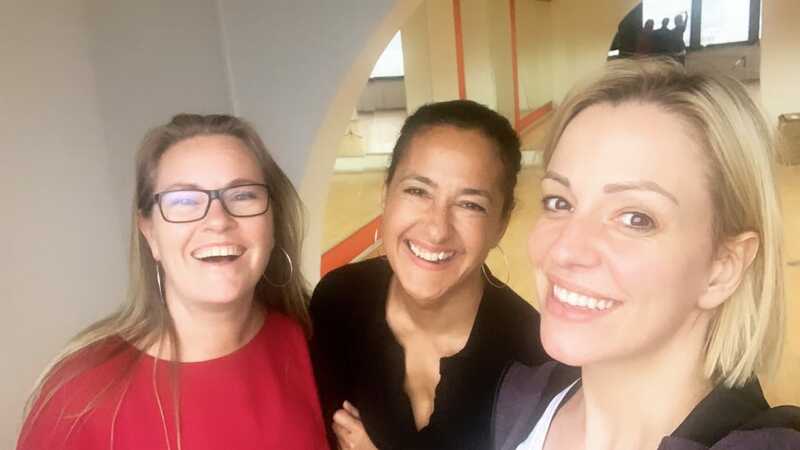 Ester Peony has started rehearsals of her Eurovision 2019 act in TVR studios. The chair that Ester Peony sang in the National Selection Final will also be on stage in Tel Aviv. It's just a detail of the fiery show designed by director Petre Năstase for the performance in Israel. Ester Peony, Romania's representative at Eurovision 2019: "I can not wait to get back to Tel Aviv, get on the stage, meet people, see how it works, get us accustomed to it"
Former heads of the Swedish delegation at the adult and Junior Eurovision Song Contests Mari Forsman Ryberger and Tine Matulessy will be responsible for the staging of the North Macedonia representative Tamara Todevska at the Eurovision 2019. Head of the Swedish delegation at the Eurovision 2016 and 2017, Mari Ryberger has worked on staging of the performanes of Robin Bengtsson, Frans and Sanna Nielsen. At the Melodifestivalen 2019, she worked with Jan Malmsjö and Nano, and last year with more than 10 entries, including John Lundvik. Ryberger also sings in the trio "Three D" with Jennie Jahns and Marie Nordmark Sjöström, who will be backing vocalists for Sergey Lazarev. The long-term head of the delegation of Sweden at the Junior Eurovision, Tine Matulessy, in addition to working on the interval acts and the contest entries of the Swedish Melodifestivalen, also worked on the staging of the entry of Belarusian singer TEO and was the backstage floor manager at the Eurovision 2017 in Kyiv. In 2009, she appeared on the Eurovision stage herself as backing singer/dancer in the entry of Malena Ernman. 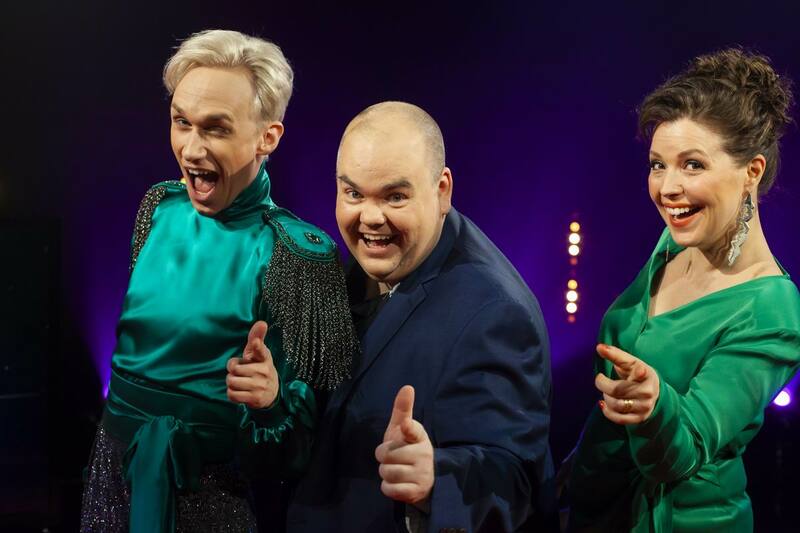 "The Eurovision Song Contest is the smörgåsbord which offers everything from fantastic delights to stomach ache" - Finnish preview show De Eurovisa analyzes this year's entries. Watch the first episode on YLE Areena. 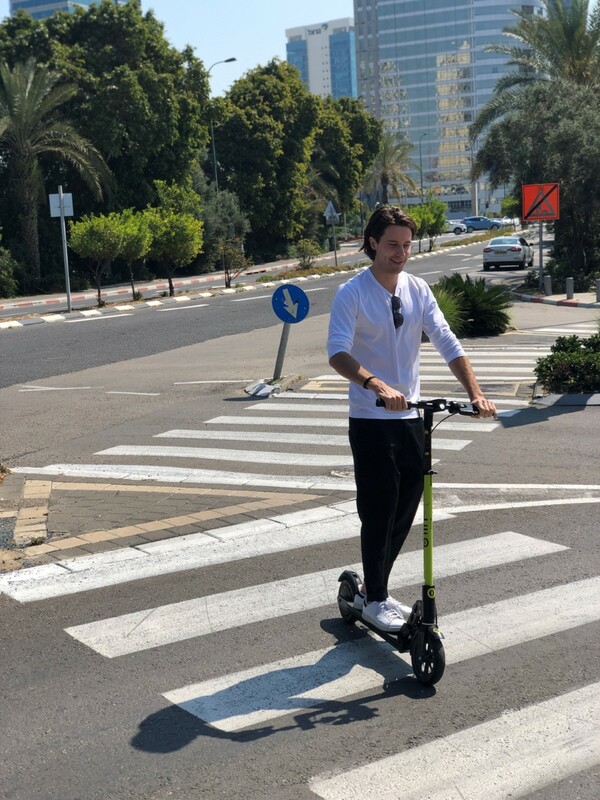 Lithuanian entrant Jurijus, who has been visiting Tel Aviv since Monday to film the Eurovision postcard, is returning to Lithuania with many impressions. He had to learn special choreography, was filmed on a car hood and in parachute base and gave interviews to Israeli and French TV. Jurijus went to Tel Aviv with Audrius Giržadas, Head of Lithuanian delegation at the Eurovision. "Israel met us with rain and wind, but as we went to the hotel, the weather improved. At the reception, the employee shouted "Hello, Jurijus! and sang "Run With The Lions". After settling down they have decided to look around the city and went to Jaffa - the old town of Tel Aviv. "We went to the Old Town market, walked down the streets, turned to the shops, into the small galleries and, of course, we got a really good dinner, "says A. Giržadas. "Later we decided to go back home by the seaside. We walked a little or a little - 6 kilometers. But we have passed the city, the famous Carmel market, "said the head of delegation. Returning to the hotel, Jurij got an unexpected surprise - a fan had left a lovely gift and a personal message. "We were pleasantly surprised - people recognized Jurijus on the street! And the most pleasant surprise - in the hotel there was a gift and a letter left by a girl, "says A. Giržadas. In the above-mentioned letter, a girl named Nerya congratulated the singer on his arrival in Israel, wishing success in the competition and praising his voice. 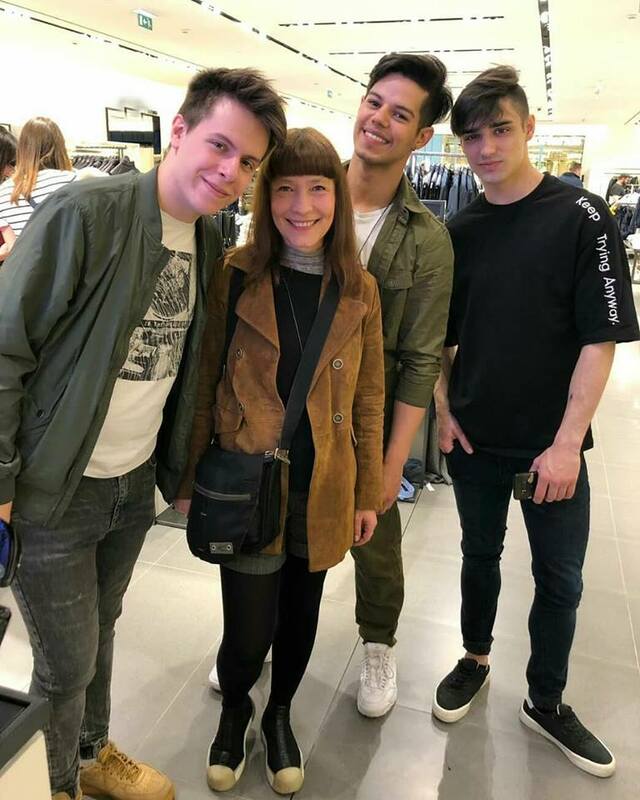 In addition, one of the four future Eurovision hosts Assi Azar also welcomed the arriving Jurijus and wished him a success in Tel Aviv. On Tuesday Lithuanian singer was rehearsing his dance act. Jurijus previously revealed to LRT that he does not like dancing and would hesitate to do so on the Eurovision stage, but the rehearsal with four dancers went smoothly. Preparations started on Wednesday from early morning and continued at the filming site, the parachute base, which houses the Museum of Old Aircrafts. Jurij himself did not dance with the parachute - although initially the Lithuanian representative was offered to do a parachute jump himself, later for the security reasons he was replaced by a stuntman. "Yesterday, the whole day we filmed in the fresh air. We started at 8 am, and we returned to the hotel in the late evening. The directors wanted the sun to film the scene on the roof of the car. Unfortunately, Yuri appeared to be too heavy for the car, so he had to be shot on the hood to protect the collector's jeep. When we returned to the hotel, we went to sleep right away, because today we went to the TV to give an interview early in the morning. It is a television program broadcast in several countries. Yuri spoke to Israel and France reporters. And now we go to the airport and fly home, "A. Giržadas told about the trip to the LRT portal. Belgian entrant Eliot has prepared a small surprise for the commuters of the Namur station. He performed there an acoustic version of his song "Wake Up" accompanied by the traveling piano of the SNCB. "Saara Kadak will not travel with us to the Eurovision," revealed head of delegation of Estonia Tomi Rahula to Õhtuleht. To the question why he answers, he doesn't know exactly. "I haven't asked her about it. This information has come from the songwriters. Maybe she's getting married? I've heard this marriage talk, but I can't confirm it, it's like an urban legend", he says referring to the unconfirmed press story that Saara and her partner Märt Pius intend to swear to each other during the Eurovision. Victor will be alone on the stage, but his backing vocal team of Kaido Põldma, Dagmar Oja and Kaire Vilgats will be enhanced by Stig Rästa himself. "Maybe there's a fifth background singer, we have not decided yet. 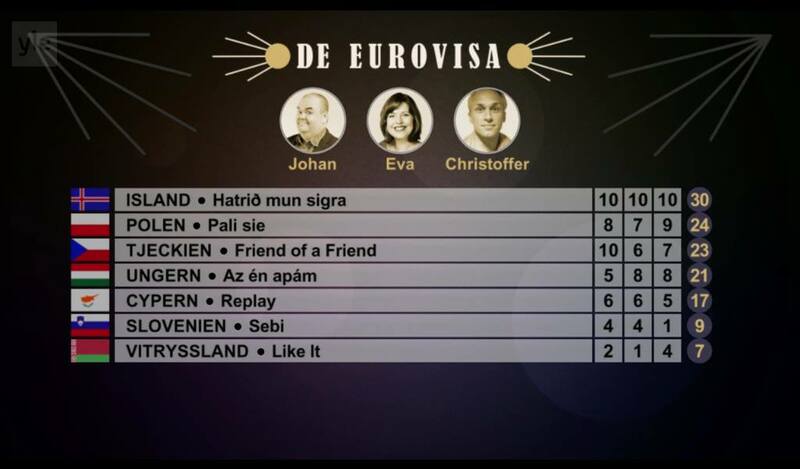 Talking about a Swedish man"
Tomi says that on the Eurovision stage they will also be supported by a graphic solution. "The Eurovision team is still working on these things, how exactly it will look like, we don't know yet"
Currently Victor Crone is in Israel to film his Eurovision postcard. Songwriters of the Lithuanian entry "Run with the Lions" Pelė Loriano (Switzerland), Eric Lumiere (USA) and Ashley Hicklin (Great Britain), after sharing the LATGA Association € 5,000 prize, are convinced that Lithuanian representative Jurij Veklenko has many chances not only to get into the Eurovision final, but also to win it. 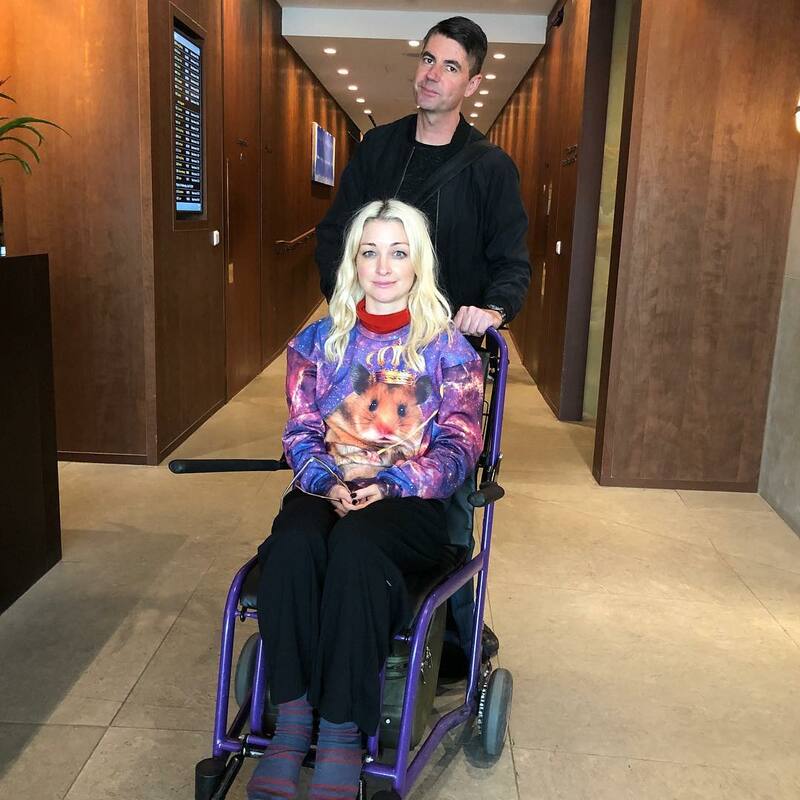 Lumiere, a Los Angeles-based songwriter, says that the chances for the success come due to the fact that both the artist and the song are special. "We really believe that Lithuania can get to the finals and win," he said. "Jurij can really go all the way and become the first Lithuanian winner of this contest with this song - we believe in this guy very much. I am absolutely convinced that people around the world will not only love his voice, but also everything related to it, "said another songwriter and producer, Hicklin. The third songwriter, Swiss Pelė Loriano, is also optimistic, saying: "Despite the fact that the second semi-final is very strong, it seems to me that the song and its performer have many opportunities to reach the final! And I think that, if everything is done right and success is on our side, Jurij can even win the competition. " Hicklin explains "Run with the Lions" is a song about freedom and the ability to do everything without fear. "It is about faith in yourself! And about true love: the line "We can't have a love in the cage" says that true feelings can't be spoiled and hurt in a kind of prison, "Loriano said. "Sincerely, this is one of my favorite songs I've ever written and it means a lot to me. In addition, we have Jurij whose voice is beautiful and unique. It was wonderful to watch the artist and the song get the highest scores and the best feedback. He really did everything to the end, so he won! "said Lumiere. Music producers admitted that a greater surprise was receiving the € 5,000 prize from the Association LATGA. "Songwriters are not often celebrating and winning. Most often we are guys in the second plan who write songs to famous people. So it's really nice that not only artists but also songwriters are awarded this competition in Lithuania, "Hicklin said. All three music authors and producers intend to go to support Jurij in Tel Aviv. "Of course, I'll be there to make sure the song sounds great. I am a very experienced TV producer (for example, "Voice", "Sing My Song" and many others), and I was many times in the "Eurovision". I know what it takes to sound good on TV, "says Loriano. "Of course we will be there and we will fly a big flag of Lithuania! 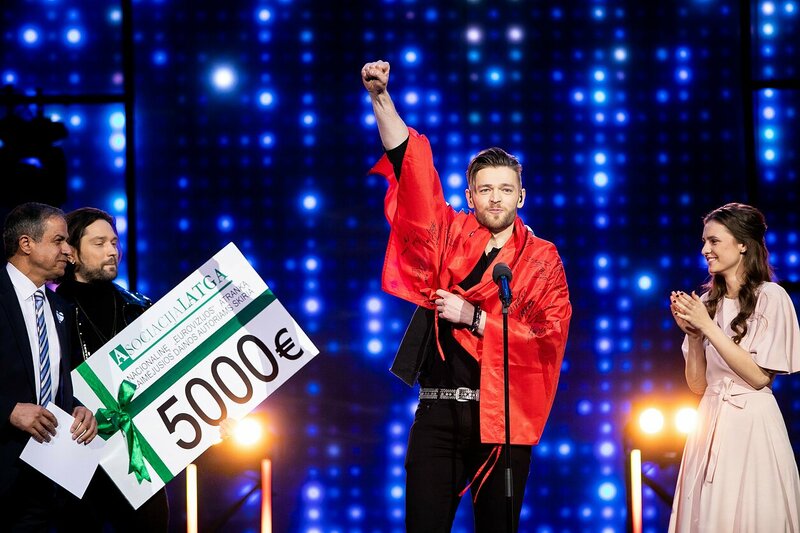 200 million people who want to hear our song are a great honor, and we want to help Jurij to do the best! "Hicklin said. "We are a real team and it is an honor for us that our song will represent Lithuania. I mean, I wouldn't have this opportunity anywhere else without Eurovision. It is amazing that more than 40 countries will meet in Tel Aviv and this is a lifetime experience. It's like a musical Olympics, "said Lumiere. As part of the preparations for the Eurovision event, which will be held in about a month, the Tel Aviv-Jaffa Municipality has decided to create a particularly thrilling surprise for tourists and residents, and has planted more than 100,000 flowers in the form of the Eurovision logo. The flowering is expected to reach its peak in two weeks and will continue to accompany the city's residents and visitors during Passover and the Eurovision Song Contest. 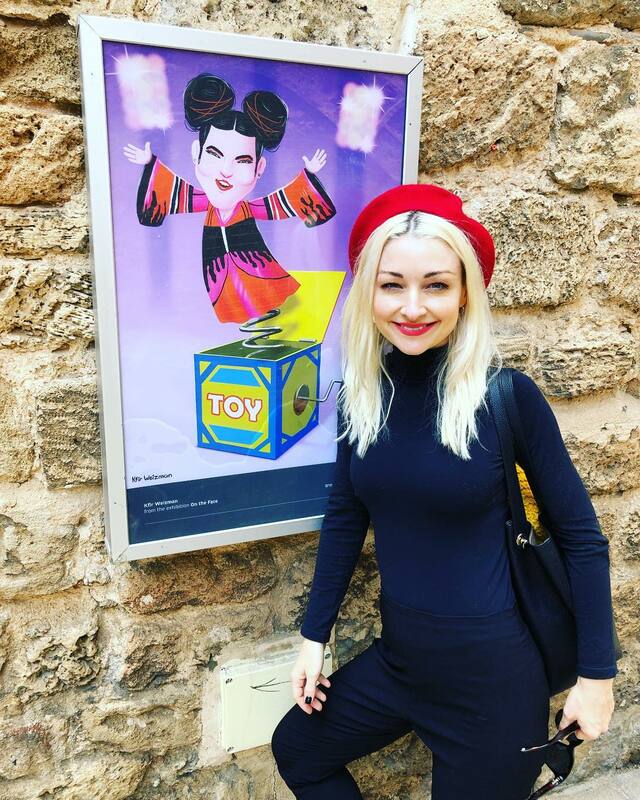 Kate Miller-Heidke is currently working on her postcard in Israel.Watch her interview for KAN.
"I was a little bit nervous going in because I know the theme is about dancing this year and I have zero skills in that department, I don't know how much I can give away, there's a little bit of drumming involved so it's music based dancing". - The video has three parallell universes. In the first, we are in an arctic climate where KEiiNO is frozen. In the second universe, the artists are dressed to represent their «spirit animals» wolf, snow fox and reindeer. In the last universe, a girl is fighting a mob. Norway’s entry for ESC 2019 check on every box of a typical Eurovision-hit: A cross-culture collaboration and an upbeat, happy song with a message of equal worth. 3 singers, each with a personal story of not being accepted, made their dreams come true joining forces. Norwegians and the indigenous people of Norway, the Samis, stood shoulder to shoulder cheering for KEiiNO during the televised national selection. Their victory is a huge win for those who have fought for acceptance of minority cultures. - Our song has a serious message, but we believe entertaining is a good way of making people listen. And there aren’t many party-songs in this years ESC, so we felt it was our mission to make a video that would bring out smiles. We are serious musicians, but as you can tell from our video, we don’t take ourselves too serious. KEiiNO is as far from a "made" project, and is truly an underdog in a competition where many entries are performed by already famous singers selected by their national TV-stations. 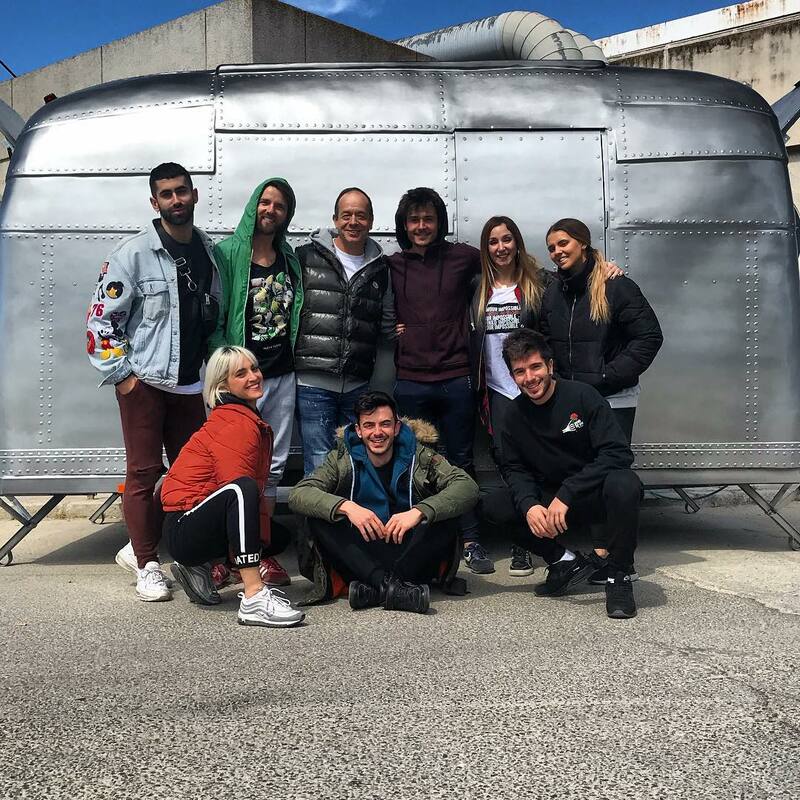 The band has paid for the video themselves, and many people involved in the making of it has contributed for free in order to support their country in the ESC. The Norwegian Broadcaster NRK has assisted with costumes, but haven’t been involved in the making of their music video. So, the video doesn’t reflect how KEiiNO’s stage show in Tel Aviv will look like. - Although I loved being a bit furrier than usual, we won’t be in animal-costumes on the Eurovision stage. We are building a new stage show at the moment, and we are so excited about the progress! Conan Osiris performed his entry "Telemóveis" in the charity concert "Hand Given to Mozambique", that was intended to raise money to help the victims of Hurricane Idai. Event took place in the Cineteatro Capitólio in Lisbon and was broadcast on Antena 1 and RTP. EBU has also confirmed Flag policy for the Eurovision 2019. - No professional camera equipment is allowed. For the avoidance of doubt: recording, or shooting (audio, video and stills) is prohibited. 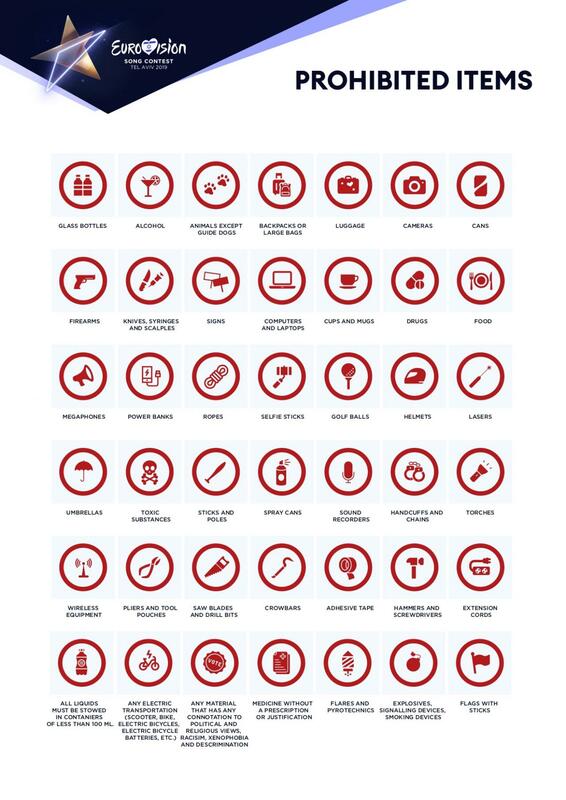 - To keep waiting times at the entrance to a minimum, please make sure you do not bring any of the following prohibited items to Expo Tel Aviv. If brought, these items will be confiscated and will not be returned. "It has been decided that pigeon holes will no longer be made available in the press centre in an effort to modernize and streamline the exchange of information between artists, delegations and the press. The EBU is dedicated to creating a greener environment by producing minimal waste wherever possible and we are excited to usher in a digital first approach for years to come! We understand that many of those attending will miss the tradition of pigeon holes, but we hope that everyone will welcome a greener, quicker and modernised approach in its place. 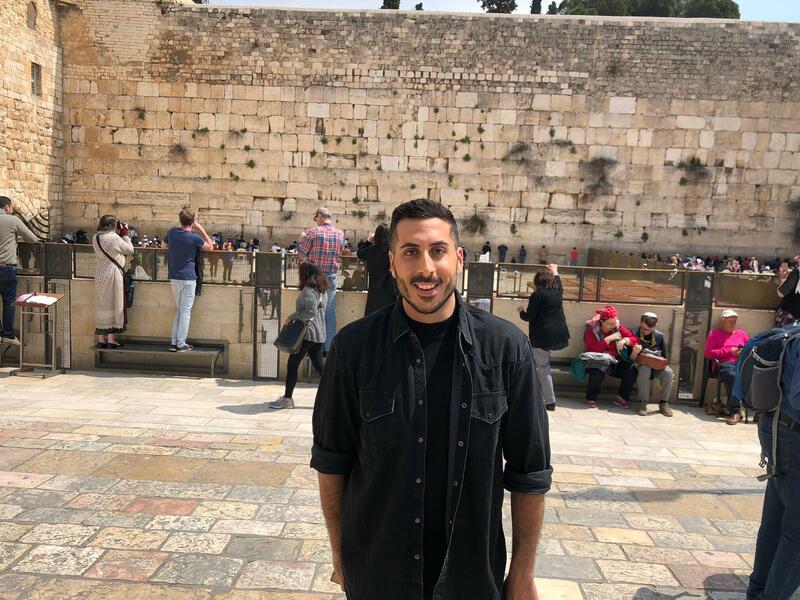 - Look out for delegations on the ground, as any physical materials will either be handed out at private events or be made available for a limited time only in the communal lounge in pavilion 11"
Kobi Marimi is filming his postcard in Jerusalem today. 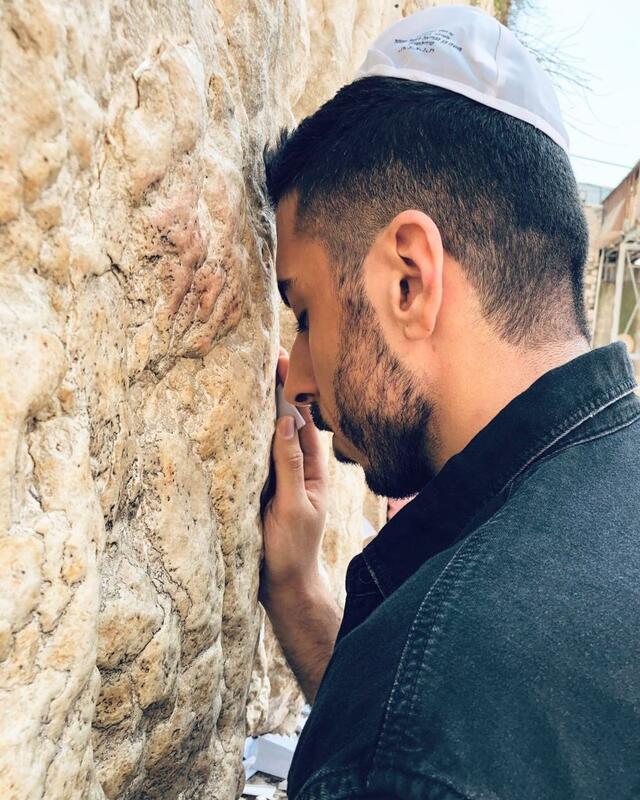 He had a minute to go to the Western Wall and he has asked for a moving Eurovision week for everyone. Watch report from the preparations for the shooting of Israeli postcard, where Kobi Marimi will be dancing with Anna Aronov. Aronov runs own ballroom dance school and is one of the most recognized Israeli personalities in the field of dance. Anna Aronov (was born in Kyrgyz SSR on January 22, 1982. In 2000 her family has migrated to Israel. She is a dancer and dance teacher, who appeared on "Dancing with the Stars" and later starred in the shows "Just want to dance", "In Love with Anna" and "VIP Survivor". Aronov has been dancing since she was 6 years old. Since 2002 she has been dancing with dancer Danny Yohtman. Together they won numerous Israeli Cups and International Cups in Latin American dance between 2003-2005. She won fifth season of "Dancing With the Stars" with Michael Lewis and also had number of second and third place finishes. As of June 2017, she serves as a judge in Keshet's dance program "Just Want to Dance". On November 15, 2018 , the reality show "In Love with Anna", in which Anna Aronov was looking for love, was broadcasted on Channel 12. Police has started inspection of the Eurovision equipment, writes producer of the show Zivit Davidovich. "41 day to the first semi final. The police is with us! Together with the dog they are checking everything so that Eurovision will be safe and we can be ready in time! Thanks to the Israeli Policemen and policewomen!" 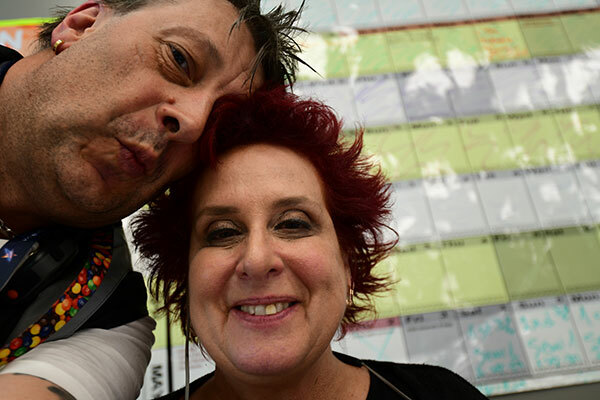 Unloading of the Eurovision equipment has not started yet, says producer of the contest Zivit Davidovich. "The crisis is not over! It's 17:10. The equipment of the Eurovision is still in the boxes! Embarrassment!!! ", she writes. Once again the works at the Eurovision Song Contest were halted, since the money commitments were not yet transferred to the Ministry of Public Security. The Ministry does not trust the commitments of the Ministry of Finance and Prime Minister's office and are waiting to see the actual transfer of the money. 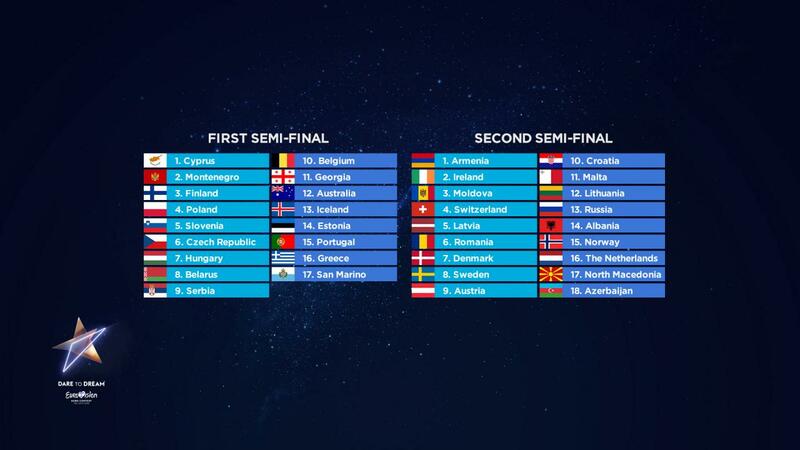 Eurovision.tv has revealed in which position the 35 countries will perform in the Semi-Finals of the 2019 Eurovision Song Contest, on 14 and 16 May. The order was decided by the producers, with the aim to create the most exciting television shows possible and ensure each act will stand out. 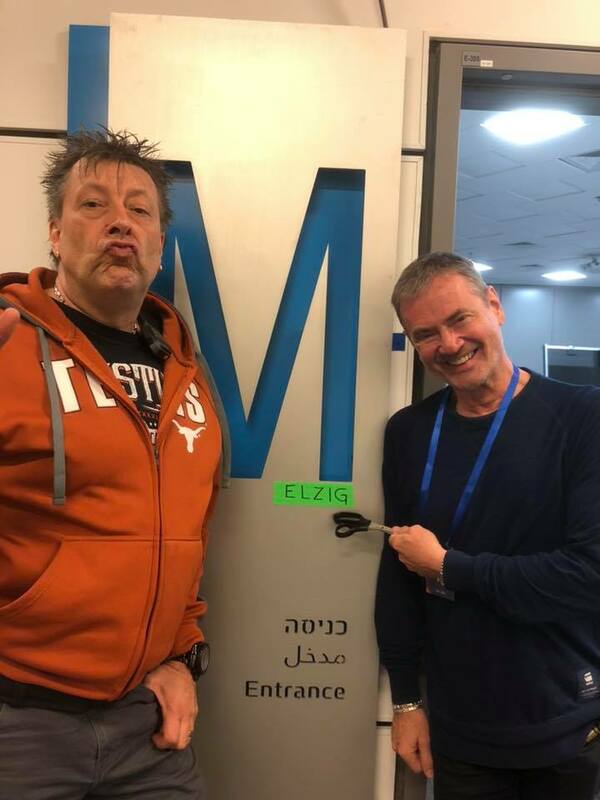 Despite the delay with allowance of trucks with equipment, yesterday the Eurovision works in the Tel Aviv Expo went underway, describes Ola Melzig in his blog post. "Our stage is located in Pavilion 2 that opened four years ago and is the newest building on the compound. Our greenroom and delegation bubble are located next door, in Pavilion 1 and the two buildings will be connected with a tunnel. Hall 2 is at the smaller end of a Eurovision venue, but make no mistake, that has not affected the ambition of this year’s production. The 7 200 spectators inside our main venue will get a show that will blow their socks off! 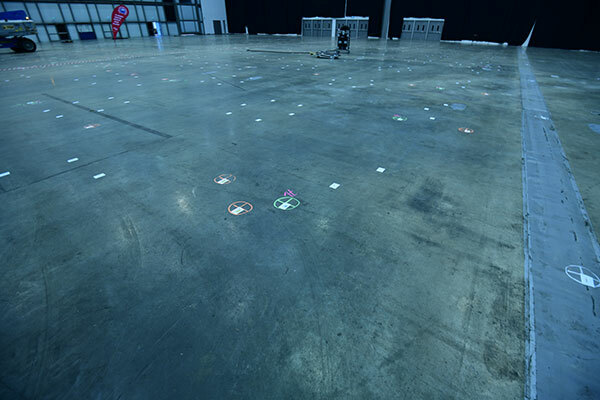 We will also have about 1500 spectators in green room to create the stunning vibrating atmosphere together with you in there during the breath taken moment of when the votes are revealed"
"The PRG rigging team has done all their markings on the floor. We've a bit over 700 rigging points, and as usual, we are at the limit of what is physically possible to load the ceiling with. We got a dayshift and nightshift team working hard on cutting holes in the panels above the top beams at 132 locations in the venue. So far, it's only Riedel that has moved in. We've also built a bunch of dressing rooms down here, for our opening and interval acts"
Works finally got completely underway today with the first trucks with equipment moving into the Expo. The first shipment of equipment has arrived in Israel at the end of last week when two 40-foot containers, including 20 tons of amplification equipment and lighting from a leading supplier for the Eurovision specializing in the supply and installation of lighting, audio, video and graphics for sports and music mass events, arrived from Italy on a ship belonging to Zim. Orian Shipping and Logistics company then handled the transportation and release of the equipment. Together with the equipment, a dedicated and professional team has arrived to install and supervise the works. The crisis seems to be over: After the battle of accusations among the various government ministries about the responsibility for budgeting the contest, the Prime Minister's Office announced that it would finance the security of the event so that there would be no danger to its existence in Tel Aviv. 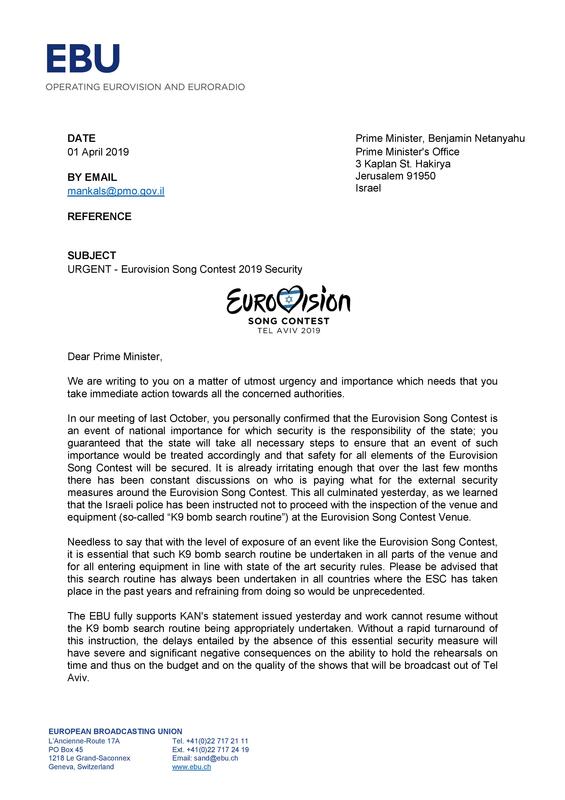 The Prime Minister's Office announced in the evening that it will transfer the necessary amount of money to finance the security of the Eurovision Song Contest in order to avoid any danger to the competition in Israel. The decision was made by the director-general of the ministry, Yoav Horowitz, and thus ended the crisis that made the Eurovision Song Contest in Tel Aviv doubtful. Earlier, before it became known that the Prime Minister's Office had decided to transfer the money, it turned out that the Ministry of Tourism had prevented the money from being transferred. The Tourism Ministry did not want to transfer NIS 1.5 million to cover the cost of securing the Eurovision Song Contest, despite the compromise formulated by the director general of the Prime Minister's Office, so the Ministry of Finance and the Ministry of Communications also decided not to transfer the money. The Ministry of Tourism said that "the security of the Eurovision Song Contest is not under the ministry's responsibility," adding that "the ministry will be happy to assist the corporation within its jurisdiction, in order to ensure that the marketing opportunity inherent in the Eurovision Song Contest will not be missed." As stated, with the announcement of the Prime Minister's Office, the matter was resolved. The Israeli Police said in response: "For many months, the Israeli Police has been preparing and carrying out a variety of preparations in order to ensure that the events of the Eurovision Song Contest are conducted properly, while ensuring the safety and security of its participants. The police are prepared with operational plans for all the events related to the Eurovision Song Contest and does not deal with budget issues and coordinate the funding sources discussed between the government ministries." "The Expo Tel Aviv is the perfect platform for a Eurovision production. 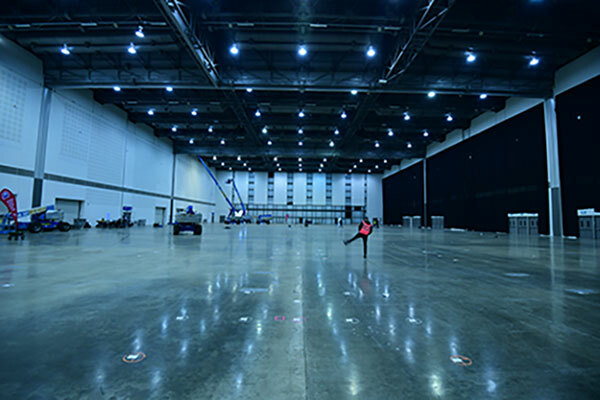 The huge footprint, all the halls and facilities has allowed us to plan a production and flow that we believe will be very comfortable for you. The 2019 stage has an iconic design and is extremely versatile with its 12 revolving LED panels, the LED floor and all the stage items that are connected to our advanced automation system, including the triangles and the four gigantic legs. And of course we got tons of lighting and pyro as well, but that comes without saying!" 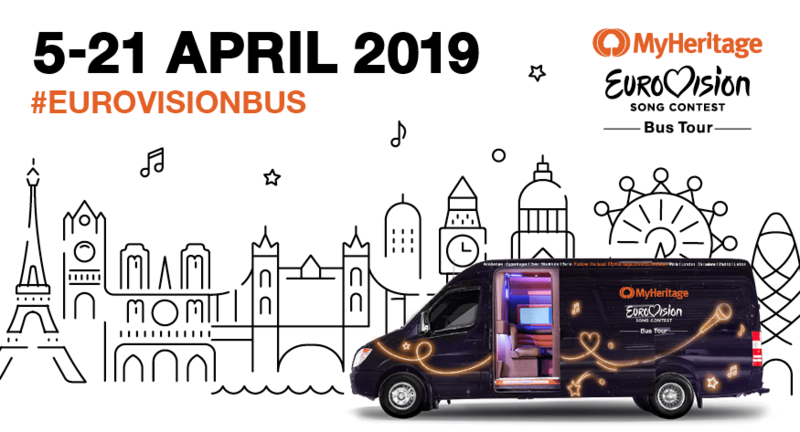 With Eurovision less than two months away, MyHeritage, as the Presenting Partner of Eurovision 2019, is inviting fans to countdown in the most spectacular way announcing the MyHeritage Eurovision Bus Tour. 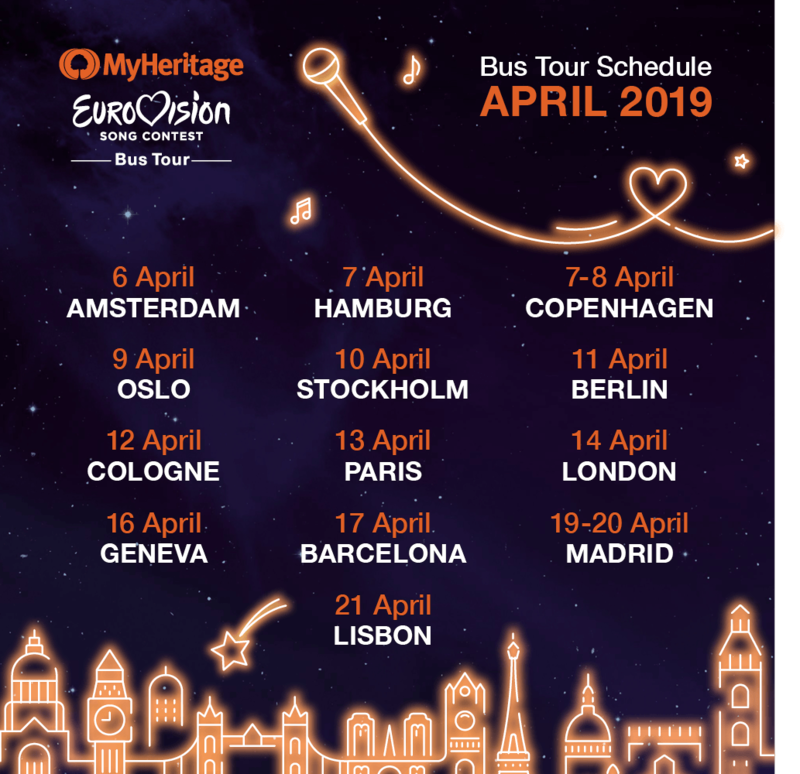 From April 5th –21st, MyHeritage is traveling to a European cities, encouraging fans to share in Eurovision fever and make exciting family history discoveries. Fully equipped with a karaoke system, the bus will give visitors the chance to enter an exclusive song competition and potentially win tickets to the Eurovision 2019 final. You’ll have the chance to meet Eurovision stars, past and present, take Eurovision-themed selfies, test your Eurovision knowledge with fun quizzes, win prizes, and take home MyHeritage Eurovision giveaways. 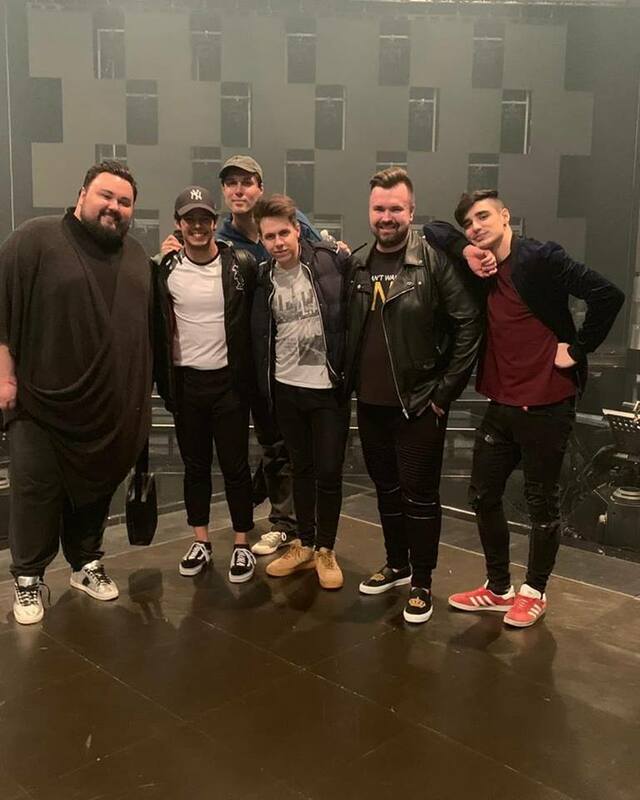 The tour aims not just to bring the spirit of Eurovision to cities around Europe, but also demonstrate the connections that bind us all into #OneBigFamily. Visitors will have the opportunity to build their own family trees on MyHeritage and perhaps discover something new about their family history. The construction work on the Eurovision Song Contest was halted on Sunday in light of the Ministry of Public Security's recent announcement that the police would stop its work to check the equipment for the Eurovision events. The reason for this is the failure to transfer a security budget by the various government ministries. "The image of the State of Israel is being violated. There is a damage of half a million shekels a day from public funds as a result of the delay due to the behaviour of the government ministries in light of the latest event following the announcement by the Ministry of Public Security regarding the cessation of police work to inspect the equipment and stoppage of the construction work in Pavilion 2. The costs will increase every other day due to the addition of additional companies according to the project's predetermined times." "At present, there are two foreign companies with manpower and equipment at the Expo, and we have now entered a 24-hour delay which causes many changes. Below are details of the financial damage that the delay causes us: Container waiting costs, Labor costs according to daily price - additional workdays were added to the days planned and calculated in advance budget, changes in the dates of flights and accomodation. Flights and accomodation have been determined in advance, and any changes entail additional costs, times of arrival and unloading of variable containers, and employee and operation costs, which operate the dismantling and assembly, additional catering days etc", quotes Srugim. 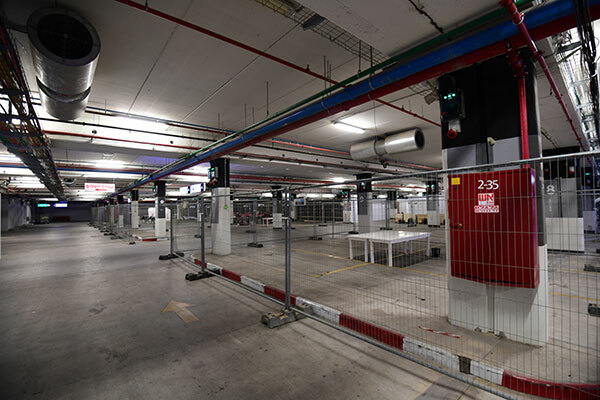 A further delay in the procedure in the police inspection of the equipment endangers the very existense of the Eurovision Song Contest in Tel Aviv, if the works will not begin immediately, according to the government's obligation to take all measures to carry out the event". "It is already irritating enough that over the last few months there has been constant discussions on who is paying what for the external security measures around the Eurovision Song Contest. This all culminated yesterday, as we learned that the Israeli police has been instructed not to proceed with the inspection of the venue and equipment (so-called “K9 bomb search routine”) at the Eurovision Song Contest Venue"
"The EBU fully supports KAN's statement issued yesterday and work cannot resume without the K9 bomb search routine being appropriately undertaken. Without a rapid turnaround of this instruction, the delays entailed by the absence of this essential security measure will have severe and significant negative consequences on the ability to hold the rehearsals on time and thus on the budget and on the quality of the shows that will be broadcast out of Tel Aviv." 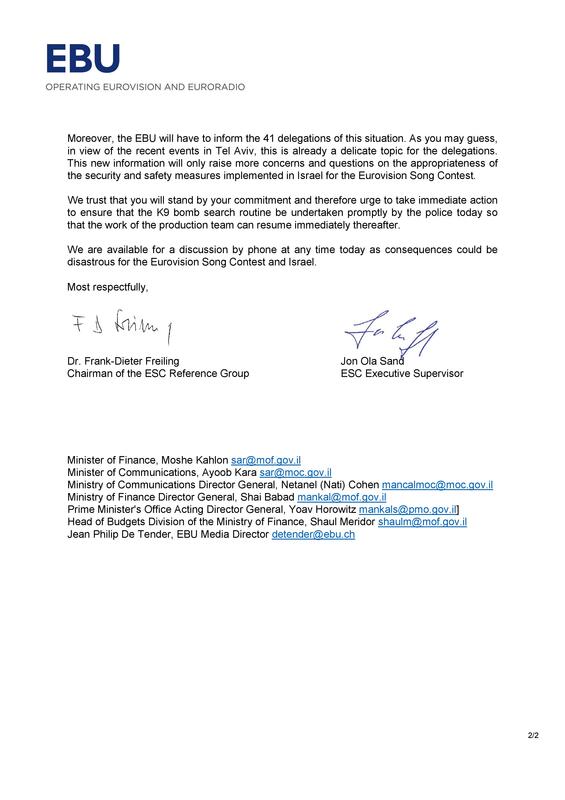 "Moreover, the EBU will have to inform the 41 delegations of this situation. As you may guess, in view of the recent events in Tel Aviv, this is already a delicate topic for the delegations. This new information will only raise more concerns and questions on the appropriateness of the security and safety measures implemented in Israel for the Eurovision Song Contest"
"Feeling ashamed of my country", says Eurovision producer Zivit Davidovitch who uploaded to the social networks video from the empty pavilion at the Tel Aviv Expo, she says: "The Eurovision pavilion - empty because of police strike against the event". Была представлена ​​акустическая версия "Kruna" и команда Невены для Израиля. Телекомпания RTS решила, что известные музыканты должны внести свой вклад в участие Сербии в Евровидении в этом году: Ивана Владович, Ольга Попович, Душан Алагич и Младен Лукич приняли участие в записи акустической версией и выступят вместе с Невеной Божович на сцене в Тель-Авиве. На сцене Евровидения Ольга Попович выступала в Азербайджане в 2012 году, когда она была участницей группы Желько Йоксимовича в качестве вокалистки и скрипачки, а Сербия заняла третье место. На протяжении более десяти лет она является постоянным членом группы Kiki Lesendrić i Piloti, победителей последней серии музыкального конкурса 3K Dur, которая выступала на самых известных европейских концертах и ​​сотрудничала с крупнейшими именами музыкальной сцены региона. Ивана Владович дважды выступала в качестве бэк-вокалистки - на Евровидении 2015 она была с Ненадом Кнезевичем Кнезом, а в 2018 году с Ваней Радовановичем - оба представляли Черногорию. В этом году вместе с квартетом Wonder Strings она участвовала в отборе представителя Сербии на фестивале Beovizija. Она профессионально занимается пением более 10 лет, работала с большим количеством музыкантов с Балкан, как солистка выступала в нескольких известных коллективах, и создала группу под своим собственным именем. Душан Алагич - композитор, автор песен, музыкальный продюсер и мультиинструменталист из Белграда. Как пианист, гитарист и бэк-вокалист, он был частью команды Желько Йоксимовича в 2012 году в Баку. Дважды он был музыкальным продюсером песен для детского конкурса Евровидение, а в 2017 году - автором песен и продюсером сербской версии песни "In Too Deep" в исполнении Тияны Богичевич. Уже более десяти лет он сотрудничает со звездами популярной музыки в регионе. Приняв участие в более чем 500 песнях за последние 15 лет и многочисленных концертах, он также является хитмейкером, студийным и концертным инструменталистом. Младен Лукич представлял Сербию на конкурсе песни Евровидение в Лиссабоне в прошлом году в качестве солиста группы Санья Илич и Балканика. Он играл на тромбоне в группе Театра на Теразии, после чего сотрудничал с Желько Йоксимовичем и трибьют-группой Эми Уайнхаус. Младен стал известен публике как финалист первого сезона шоу "X Factor". Он является профессором инструментальной музыки в секции оркестра музыкальной школы имени Иосипа Славенского в Белграде. Музыку и текст для акустической версии песни "Kruna" написала сама Невена Божович. Аранжировку сделал Душан Алагич, который, помимо бэк-вокала, играл на пианино, гитаре и басу, а Теодора Николич - на виолончели. L8NightStudioBelgrade отвечает за запись и микширование акустической версии. Команда Сербии продолжает работу над продвижением песни "Kruna", и после акустической версии скоро будет опубликован официальный видеоклип, а затем версия на английском языке с симфоническим оркестром. "Поездка заканчивается не так, как я ожидала. С болезненной инфицированной ногой. Из-за волдыря. От слишком большого количества танцев на острых каблуках по булыжным улицам. Доктор говорит, что мне не разрешат ходить в течение недели. Безжалостный гламур!" Танцоры Энди Шрёттер и Диего Сикейра выступят на сцене с Роко Блажевичем. Энди - 21-летний пакрациец, живущий в Загребе. Также известный как "хорватский Джастин Бибер", он учится на последнем курсе современного танца в Академии драматического искусства в Загребе и является лауреатом многих танцевальных конкурсов, среди которых Оскар Знания в 2016 году - он был награжден Агентством по образованию и обучению за 1 место занятое в Государственном конкурсе танца. Его мегахит "Atom", который был просмотрен более девяти миллионов раз на Youtube, выпустил Энди на звездную орбиту в возрасте всего 14 лет. Параллельно с его экстравагантной песенной карьерой этот кумир молодежи также развивает свою танцевальную карьеру. Энди также был членом команды Жака Хоудека в 2017 году и снялся в клипе "My Friend". - Для меня - выступление на Евровидении за свою родину перед более 200 миллионов зрителей - это мечта, венец в моей карьере! С большой радостью я принял приглашение HRT помочь Роко в танцевальном воплощении позыва его песни, и для меня это огромный художественный вызов. Танец и музыка - ритм моей жизни; через них я создаю, мечтаю, чувствую, вижу, слышу, наслаждаюсь, живу жизнью! Я с нетерпением жду своей роли на сцене Евровидения и того какой она будет. В любом случае, команда авторов в сотрудничестве с лучшим хореографом Лео Муйичем создала великолепную концепцию, которая покорит аудиторию по всей Европе, я не сомневаюсь в этом, и я с нетерпением жду возможности прилететь в Тель-Авив и выступить на грандиозной сцене и мероприятии, которое обеспечивает самые высокие стандарты производства! Все, о чем вы можете мечтать - вы способны добиться! 30-летний бразилец Диего Сикейра постоянно проживает в Хорватии (в течение последних девяти лет) и нашел свою страсть в культуре хип-хопа. Он выступал и ставил танцевальные постановки по всему миру (Германия, Финляндия, Уэльс, Англия, Италия, Бразилия ...), танцевал в различных танцевальных стилях (джаз, балет, поппинг, бальные, локинг, хаус, брейк-данс ... ) и сегодня он преподает танец в четырех танцевальных студиях в Загребе и обучает более ста танцоров. Он выступал со многими экстравагантными звездами, в том числе с двумя представителями Хорватии на Евровидении - Франкой Бателич (на шоу Доры в этом году) и Ниной Кралич (на фестивале в Загребе в 2019 году). - Когда я узнал, что буду выступать на Евровидении, с большим нетерпением и волнением, я начал считать дни до отъезда в Тель-Авив. Хорватия - мой новый дом, здесь я живу девять лет и обожаю эту прекрасную страну и ее жителей. Я благодарю HRT и авторов "The Dream", которые оказали мне большое доверие, и мне выпала честь выступить в качестве танцора с хорватским представителем Роко. Я обещаю, что сделаю все возможное, чтобы как можно лучше интерпретировать эту замечательную музыкальную историю через танцевальное движение. Мы отличная команда, я рад, что Хорватия на Евровидении посылает молодость, мужество, честность и большой талант - я уверен, что это не может остаться незамеченным! "Я горжусь тем, что помимо Роко, два других молодых артиста вошли в нашу команду. Помимо того, что Энди - известная регионально узнаваемая звезда-подросток, а Диего также узнаваем в танцевальных кругах, оба являются прекрасными и ценными партнерами и коллегами. Мне особенно приятно видеть, что Хорватия будет самой молодой командой - они заслуживают успеха своей усиленной работой. Таким образом мы несем позитивный месседж и укрепляют видение и миссию нашей песни - мечты сбываются! Официальный музыкальный клип на песню "The Dream" будет выпущен в ближайшее время. RTVE опубликовал интервью с художественным руководителем испанского номера Фокасом Эвагелиносом и музыкальным руководителем Мамен Маркес. "Фокас и я, мы работаем как команда, хотя у каждого из нас есть сюжет, мы координируем, чтобы хореография и вокал не оказывали негативного влияния друг на друга", - говорит Мамен Маркес. Что касается работы с Мики, оба режиссера соглашаются, что у него много энергии, и он передает ее команде. Кроме того, певец очень настойчив и дотошен, что облегчает работу. Мамен рассказала о некоторых упражнениях, которые она ставит перед Мики во время репетиций, чтобы он мог одновременно петь, танцевать и прыгать, не теряя дыхания. "Мы должны заполнить всю сцену ... и это очень большое пространство, поэтому мы работаем над этим с помощью упражнений, таких как прыжки со скакалкой или бросание мяча во время пения, что выполняют и он сам, и его танцоры", - говорит эксперт в вокальной технике. Со своей стороны, Фокас Эвагелинос рассказал очень мало подробностей того, каким будет номер. "Я не могу сказать много, но я уверен, что вся публика, как на арене, так и дома, отождествит себя с постановкой"
И это очень важно, поскольку, как неоднократно заявлял Мики, он не будет выпускать английской версии "La venda"; так что эстетика, образ и хореография на сцене Тель-Авива должны говорить на универсальном языке, чтобы послание песни достигло каждого. В этом году Фокас также работает художественным руководителем номера Сергея Лазарева, который возвращается, чтобы представлять Россию с песней "Scream". Фокас уверяет, что он согласился работать с испанским и российским артистами, потому что они очень разные, с совершенно противоположными стилями в песне, внешности певца и постановке. В противном случае он не согласился бы сотрудничать с двумя артистами. Кроме того, Фокас рассказал о греческой песни Катерины Дуски - он считает, что это сильная ставка и что в этом году их страна может забрать себе хрустальный микрофон. Мамен, которая верит в Мики на 100%, также видит в Дуске возможности, потому что, по ее словам, "у нее прекрасный голос, и именно она делает песню великолепной". «Erev Tov Eyropa» (Добрый вечер Европа) - студийная программа, которую будут вести Дафна Люстиг и Авиа Малка, будет транслироваться на канале KAN 11 с этого воскресенья, 14 апреля, ежедневно с воскресенья по четверг с 17:30-18:00, c повтором в 23:20 и 11:30 по времени Москвы. В программе примут участие лучшие израильские участники Евровидения всех времен, деятели культуры, комики, певцы и представители стран, участвующих в Евровидении-2019. В программе также будут исполнены самые любимые песни Евровидения. "Добрый вечер Европа" также будет содержать специальные сегменты, в том числе цифровой сегмент с участием Шахара Гева, сегмент "Кайзера" Итая Германа, в котором он проверит знания ведущих и участников о конкурсе и "Гриль" с реакциями на песни Евровидения. Зарубежные корреспонденты программы будут следить за подготовкой артистов перед выступлениями, а Шани Нахшони будет рассказывать новости о том, что происходит за кулисами Евровидения. Подтверждено Live Nation: Мадонна выступит на Евровидении в Тель-Авиве. Ранее 1 апреля информация была неофициально подтверждена источником Israel Hayom. Мадонна исполнит две песни, объявила компания Live Nation Israel, принадлежащая Гаю Бессеру и Шаи Мор Йосефу. Ожидается, что певица прибудет в Израиль за 4 дня до финала с командой из более чем 60 человек и остановится в отеле Dan в Тель-Авиве. Ответственным за ее появление в Израиле является Ассаф Блехер, ранее работавший на Оскаре и Золотом глобусе. Live Nation добавляет, что возможно, что два других международных артиста также появятся на шоу Евровидения. Канадский миллиардер Сильван Адамс, который помог привезти певицу в Израиль, говорит: "Я верю, что ее участие в этом мероприятии внесет реальный вклад в успех Евровидения и брендинг Израиля в мире". Подробности ее ДНК теста можно найти здесь, а анализ ДНК Шарлотты Перелли здесь. "Вечеринка у Биляла дома". Представитель Франции Билял Хассани устроил себе домашнюю вечеринку Евровидения, во время которой также представил отрывок обновленной версии своей конкурсной песни Roi. Томи и Виктор отправились в Тель-Авив во вторник. "Мы путешествовали весь день. Я приехал раньше, Виктор приехал из Стокгольма, и его рейс опоздал, но он все же прибыл вовремя. Вторник был днем ​​репетиций, вечером мы поехали в старый город на ужин. Здесь все очень хорошо организовано. Это было прекрасное время". Томи смеется, что он сам еще не понял, о чем именно будет открытка. "Было много техник движения, которые были опробованы в репетиционной комнате с танцорами во вторник. Но все открытки построены на движении и связаны с местными танцевальными группами. Певцы также двигаются сами, некоторые танцуют больше, некоторые меньше". Томи надеется, что результат получится потрясающим. Эстер Пеони начала репетиции своего выступления на Евровидении 2019 в студии TVR. Кресло, в которым Эстер пела в финале национального отбора, также появится и на сцене в Тель-Авиве. Это просто деталь зажигательного шоу, созданного режиссером Петре Нэстасе для представления в Израиле. Эстер Пеони, представительница Румынии на Евровидении 2019: "Я не могу дождаться, чтобы вернуться в Тель-Авив, выйти на сцену, встретиться с людьми, посмотреть, как это работает, привыкнуть ко всему". Бывшие главы делегации Швеции на взрослом и Детском Евровидениях Мари Рюбергер и Тине Матулесси будут отвечать за постановку номера Северной Македонии на Евровидении 2019. Глава делегации Швеции на Евровидении 2016 и 2017, Мари Рюбергер занималась постановкой номеров Робина Бенгтссона, Франса и Санны Нильсен. На МФ 2019 она работала с Яном Мальмшё и Нано, а в прошлом году со свыше 10 конкурсных номеров, включая Йона Лундвика. Рюбергер также поет в трио "Three D" с Йенни и Мари, которые будут бэк-вокалистками у Сергея Лазарева. Многолетняя глава делегации Швеции на Детском Евровидении, Тине Матулесси, помимо работы над интервал актами и номерам шведского Мелодифестивалена, также занималась номером беларуса ТЕО и была backstage floor manager на Евровидении в Киеве. В 2009 году она выступала на сцене Евровидения в номере Малены Эрнман. "Конкурс песни Евровидение - это шведский стол, который предлагает все - от фантастических удовольствий - до боли в животе" - финское превью шоу De Eurovisa анализирует участников этого года. Смотрите первый эпизод на YLE. Представитель Литвы Юриюс, который с понедельника был в Тель-Авиве, чтобы снять свой посткард, возвращается в Литву со многими впечатлениями. Он должен был научиться специальной хореографии, снялся на капоте автомобиля и на парашютной базе и дал интервью израильскому и французскому телевидению. Юриюс отправился в Тель-Авив с Аудрюсом Гиржадсом, главой литовской делегации на Евровидении. "Израиль встретил нас дождем и ветром, но когда мы приехали в гостиницу, погода улучшилась. На приеме сотрудник крикнул: "Привет, Юриюс!" и они запели "Run with the Lions". Поселившись, литовцы решили осмотреть город и отправились в Яффо - старый город Тель-Авива. "Мы пошли на рынок Старого города, прошли по улицам, свернули к магазинам, в небольшие галереи и, конечно, мы устроили себе очень вкусный обед", - говорит А. Гиржадас. "Позже мы решили вернуться домой пешком, вдоль моря. Мы прошли около 6 километров. Мы посмотрели город, знаменитый рынок Кармель", - сказал глава делегации. Вернувшись в отель, Юрий получил неожиданный сюрприз - фанатка оставила ему прекрасный подарок и личное сообщение. "Мы были приятно удивлены - люди узнавали Юриюса на улице! И самый приятный сюрприз - в отеле был подарок и письмо, оставленное девушкой", - рассказывает А. Гиржадас. В вышеупомянутом письме девушка по имени Нерия поздравила певца с прибытием в Израиль, пожелав ему успехов в конкурсе и похвалила его голос. Кроме того, один из четырех будущих ведущих Евровидения Асси Азар также приветствовал прибывающего Юрия и пожелал ему успехов в Тель-Авиве. Во вторник литовский певец репетировал свой танцевальный номер. Ранее Юриюс рассказал LRT, что он не любит танцевать и не решился бы делать это на сцене Евровидения, но репетиция с четырьмя танцорами прошла гладко. Подготовка началась в среду с раннего утра и продолжалась на съемочной площадке, на парашютной базе, где находится Музей старых самолетов. Юрий сам не танцевал с парашютом - хотя сначала литовскому представителю предлагалось самому совершить прыжок, позже по соображениям безопасности его заменил каскадёр. "Вчера весь день мы снимали на свежем воздухе. Мы начали в 8 часов утра и вернулись в отель поздним вечером. Режиссеры хотели, чтобы на солнце мы сняли сцену на крыше машины. К сожалению, Юрий оказался слишком тяжелым для крыши, поэтому ему пришлось встать на капот, чтобы не испортить коллекционный джип. Когда мы вернулись в отель, мы сразу пошли спать, потому что сегодня мы еще побывали на телевидении и дали интервью телевизионной программе, транслируемой в нескольких странах. Юрий побеседовал с журналистами из Израиля и Франции. А теперь мы идем в аэропорт и летим домой", рассказал Гиржадас о поездке порталу LRT. Бельгиец Элиот приготовил небольшой сюрприз для пассажиров станции Намюр. Там он исполнил акустическую версию своей песни "Wake Up" в сопровождении передвижного рояля Национального Общества Железных Дорог Бельгии. В зале, тем временем, началась работа над подвешиванием креплений к потолку. Авторы литовской песни "Run with the Lions" Пеле Лориано (Швейцария), Эрик Люмьер (США) и Эшли Хиклин (Великобритания), получив приз ассоциации LATGA в размере 5000 евро, убеждены, что представитель Литвы Юрий Векленко имеет много шансов не только попасть в финал Евровидения, но и выиграть его. Люмьер, автор песен из Лос-Анджелеса, говорит, что шансы на успех приходят из-за того, что и артист, и песня особенные. "Мы действительно верим, что Литва может выйти в финал и победить", - сказал он. "Юрий действительно может пройти весь путь до конца и стать первым литовским победителем этого конкурса с этой песней - мы очень верим в этого парня. Я абсолютно убежден, что люди во всем мире полюбят не только его голос, но и все, что связано с ним, "говорит другой автор песни и продюсер, Хиклин. Третий автор песен, швейцарец Пеле Лориано, также настроен оптимистично: "Несмотря на то, что второй полуфинал очень силен, мне кажется, что песня и ее исполнитель имеют много возможностей выйти в финал! И я думаю, что если все будет сделано правильно и удача будет на нашей стороне, Юрий сможет даже выиграть соревнование. " Хиклин объясняет, что "Run with the Lions" - это песня о свободе и способности делать все без страха. "Речь идет о вере в себя! И об истинной любви: строка "У нас не может быть любви в клетке" говорит о том, что настоящие чувства нельзя испортить и обидеть в некой тюрьме", - сказал Лориано. "Это одна из моих любимых песен, которые я когда-либо писал, и она очень много значит для меня. Кроме того, у нас есть Юрий, чей голос красив и уникален. Было замечательно наблюдать, как артист и песня получают самые высокие оценки и лучший фидбек. Он действительно сделал все возможное, поэтому он победил! "- говорит Люмьер. Музыкальные продюсеры признались, что большим сюрпризом стало получение приза в размере 5000 евро от Ассоциации LATGA. "Авторы песен не часто празднуют. Чаще всего мы парни второго плана, которые пишут песни известным людям. Поэтому очень приятно, что не только артисты, но и авторы песен награждаются на конкурсе в Литве", - сказал Хиклин. Все три музыкальных автора и продюсера собираются отправиться на поддержку Юрия в Тель-Авив. "Конечно, я буду там, чтобы песня звучала великолепно. Я очень опытный телевизионный продюсер (например, "Голос", "Sing your song" и многие другие), и я много раз был на "Евровидении". Я знаю, что нужно для хорошего звучания на телевидении", - говорит Лориано. "Конечно, мы будем там и будем поднимать большой флаг Литвы! 200 миллионов человек, которые хотят услышать нашу песню - большая честь, и мы хотим помочь Юрию сделать все возможное! ", добавляет Хиклин. "Мы - настоящая команда, и для нас большая честь, что наша песня будет представлять Литву. У меня не было бы такой возможности нигде без Евровидения. Удивительно, что более 40 стран встретятся в Тель-Авиве, - это как музыкальная Олимпиада", - сказал Люмьер. В настоящее время представитель Литвы Юрий Векленко находится в Тель-Авиве на съемках своего посткарда. Интервью с представительницей Австралии Кейт Миллер Хайдки во время съемка ее посткарда. "Я немного нервничала, потому что знаю, что в этом году тема танцев, а у меня абсолютно нет никаких навыков в этом отделе. Я не знаю, насколько я могу раскрыть секрет, но там будет немного барабанов, так что это музыка с элементами танца"
Конкурс Песни Евровидение многими считается сказкой, и режиссер Мартин Софиедаль также вдохновлялся некоторыми из сказок при создании видеоклипа представителей Норвегии KEiiNO. - В видео три параллельные вселенные. Во-первых, мы находимся в арктическом климате, где KEiiNO заморожены. Во второй вселенной артисты одеты так, чтобы представить своих "духовных животных", волка, снежного лиса и оленя. В последней вселенной девушка сражается с толпой. Песня Норвегии на Евровидении 2019 соответствует всем критериям Евровидения: кросс-культурное сотрудничество, жизнерадостная, веселая песня с месседжем о равноправии. Три исполнителя, у каждого из которых была своя история, о том, что их не принимали, воплотили свои мечты, объединив усилия. Норвежцы и коренные жители Норвегии, саамы, встали плечом к плечу, болея за KEiiNO во время эфира национального отбора. Их победа - огромная победа для тех, кто боролся за принятие культур меньшинства. - У нашей песни серьезный посыл, но мы считаем, что развлечения - хороший способ заставить людей слушать. И в этом году на Евровидении не так много песен, подходящих для вечеринок, поэтому мы почувствовали, что нашей миссией было сделать клип, который бы вызывал улыбки. Мы серьезные музыканты, но, как вы можете заметить из нашего видео, мы не относимся к себе слишком серьезно. KEiiNO настолько же далеки от "искусственного" проекта, и он действительно темные лошадки в конкурсе, где многие песни исполняют уже известные артисты, отобранные их национальными телевещателями. Группа сама оплатила за клип, и многие люди, участвовавшие в его создании, внесли свой вклад бесплатно, чтобы поддержать свою страну на конкурсе. Норвежский вещатель NRK помог с костюмами, но не участвовал в создании музыкального клипа. Таким образом, видео не отражает, как будет выглядеть сценическое шоу KEiiNO в Тель-Авиве. - Хотя мне нравилось носить больше меха, чем обычно, мы не будем в костюмах животных на сцене Евровидения. Сейчас мы работаем над новым сценическим шоу, и мы очень довольны тем, как эта работа проходит! В Tel Aviv Expo второй день подготовки зала. Об этом подробно пишет Ола Мелциг в сегодняшнем блоге. Конан Осирис исполнил свою песню "Telemóveis" на благотворительном концерте "Рука, протянутая Мозамбику", который был призван собрать деньги в помощь жертвам циклона Идай. Мероприятие состоялось в Cineteatro Capitólio в Лиссабоне и транслировалось телеканалами Antena 1 и RTP. Репортаж с подготовки к съемкам посткарда Израиля, где Коби Мерими будет танцевать с Анной Аронов. Анна родилась в Киргизии. В 1999 году она со своими родителями и братом репатриировалась в Израиль. Многократная чемпионка Израиля по Латинским танцам, она стала символом страны во всем, что связано с салонными танцами. С 2005-2010 года участвовала в популярнейшем телевизионном шоу "Танцы со звездами", где несколько раз доходила до финала, а в сезоне 2010 года заняла первое место. Анна также стала звездой реалити-шоу "Полюбить Анну" (телевизионный формат, когда несколько претендентов борются за руку и сердце главной героини, как правило, звезды. В России похожая программа называлась "Замуж за Бузову"). На сегодняшний день, Анна имеет свою школу танцев, а так же активно и с большим успехом участвует в различных телевизионных и рекламных проектах страны. "Кризис не закончился! Сейчас 17:10. Оборудование Евровидения все еще в контейнерах! Стыд !!! ", - пишет она. Несмотря на задержку в допуске грузовиков с оборудованием, вчера в Tel Aviv Expo прошел первый день подготовки зала. Об этом подробно пишет Ола Мелциг в сегодняшнем блоге. Глава технического отдела Евровидения Ола Мелциг открыл свой блог, посвященный подготовке к конкурсу. "Экспо Тель-Авив является идеальной платформой для производства Евровидения. Огромная площадь, все залы и помещения позволили нам спланировать производство и порядок, который, по нашему мнению, будет очень удобным для всех. Сцена 2019 года имеет форму ромба и чрезвычайно универсальна благодаря 12 вращающимся светодиодным панелям, светодиодному полу и всем элементам сцены, которые подключены к нашей современной системе автоматизации, включая треугольники и четыре гигантских ножки. И, конечно же, мы получили тонны освещения и пиротехники, но это само собой разумеется!" "В настоящее время на Экспо уже находятся две иностранные компании с рабочей силой и оборудованием, и мы уже ввели 24-часовую задержку, которая вызывает много изменений. Ниже приводятся подробности финансового ущерба, который причиняет нам эта задержка: затраты на ожидание контейнеров, трудозатраты, расходы в соответствии с суточной ценой - дополнительные дни были добавлены к запланированным и рассчитанным в предварительном бюджете дням, изменения в датах полетов и проживания. Полеты и проживание были определены заранее, а любые изменения влекут за собой дополнительные расходы, время прибытия и выгрузки контейнеров, а также расходы на персонал и эксплуатацию, которые осуществляют демонтаж и сборку, дополнительные дни питания и т. д." "Дальнейшая задержка в процедуре полицейского осмотра оборудования ставит под угрозу само проведение Конкурса Песни Евровидение в Тель-Авиве, если работы не начнутся немедленно, в соответствии с обязательством правительства принять все меры для проведения мероприятия". "Павильон Евровидения - пустой из-за полицейской забастовки против мероприятия".